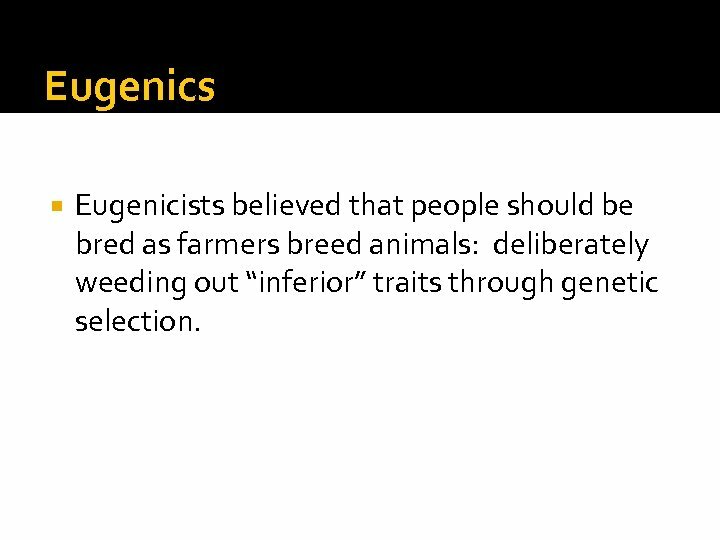 Eugenics Eugenicists believed that people should be bred as farmers breed animals: deliberately weeding out “inferior” traits through genetic selection. 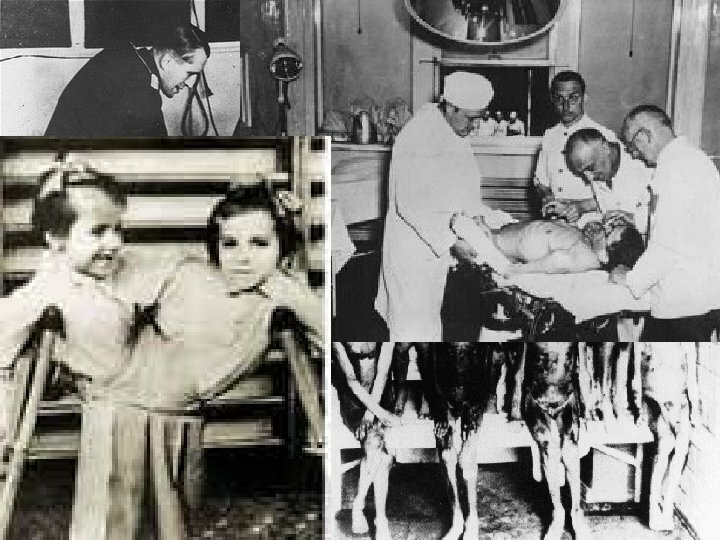 Bizarre Parlor Talk? 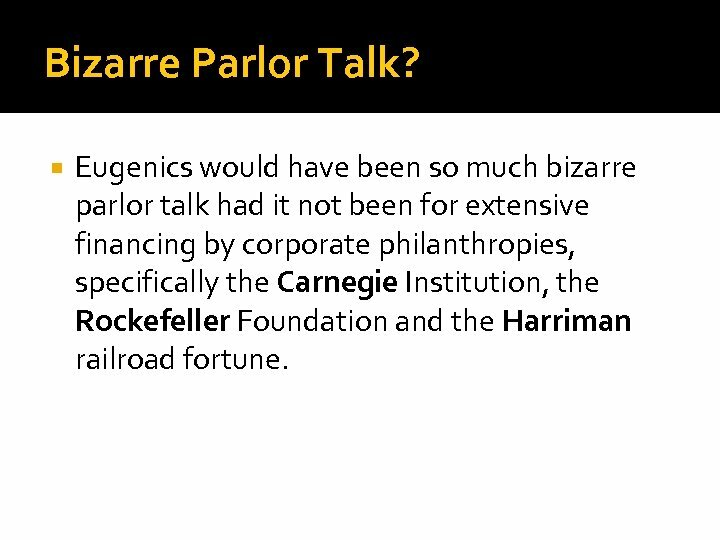 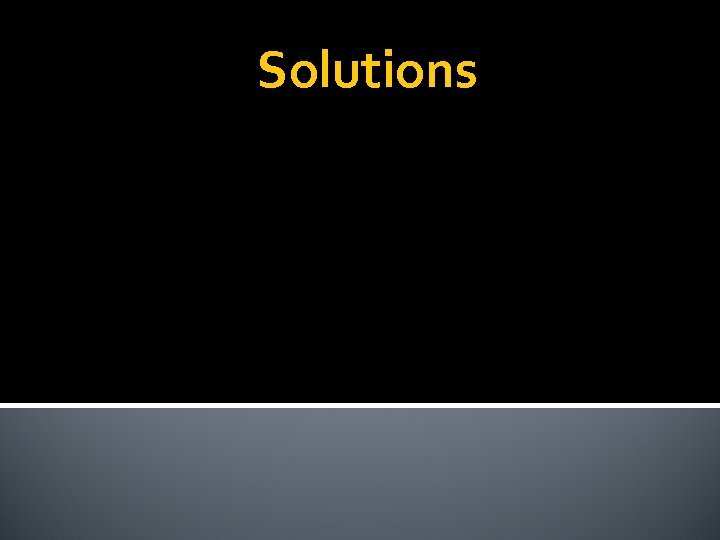 Eugenics would have been so much bizarre parlor talk had it not been for extensive financing by corporate philanthropies, specifically the Carnegie Institution, the Rockefeller Foundation and the Harriman railroad fortune. 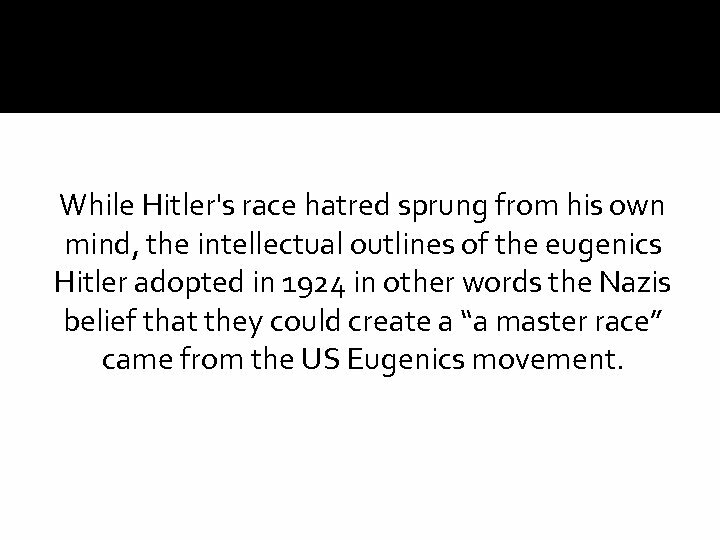 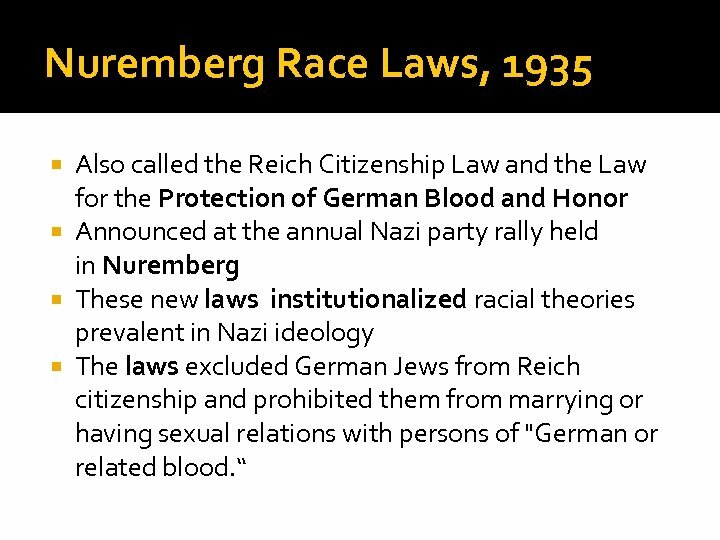 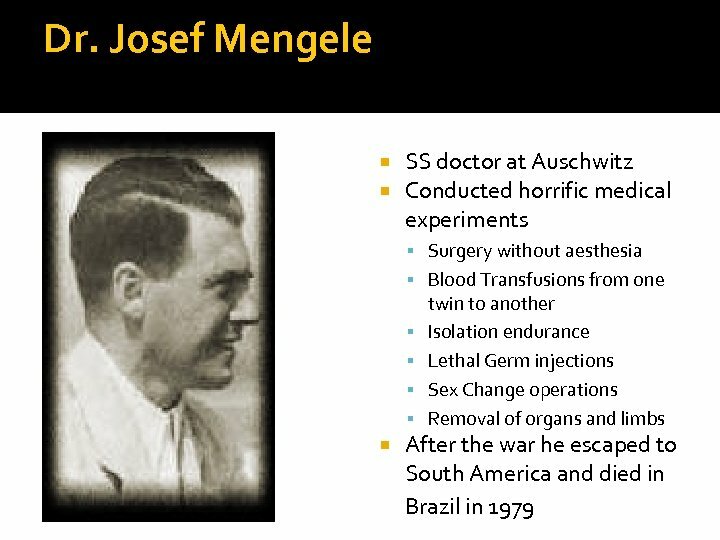 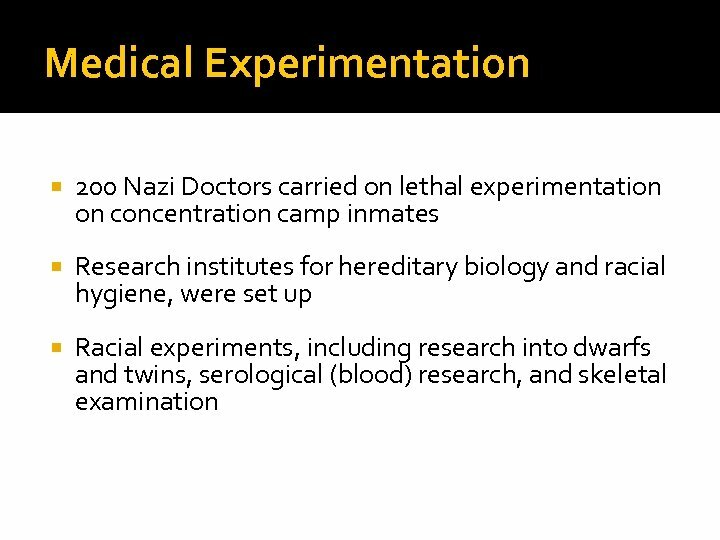 While Hitler's race hatred sprung from his own mind, the intellectual outlines of the eugenics Hitler adopted in 1924 in other words the Nazis belief that they could create a “a master race” came from the US Eugenics movement. 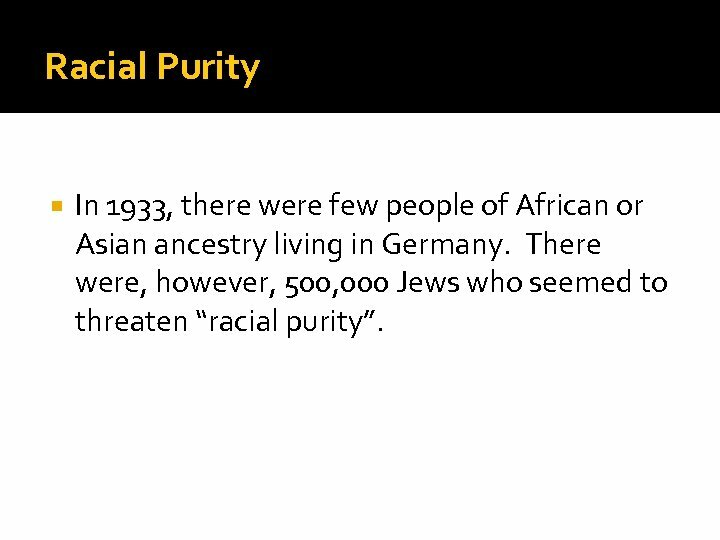 Racial Purity In 1933, there were few people of African or Asian ancestry living in Germany. 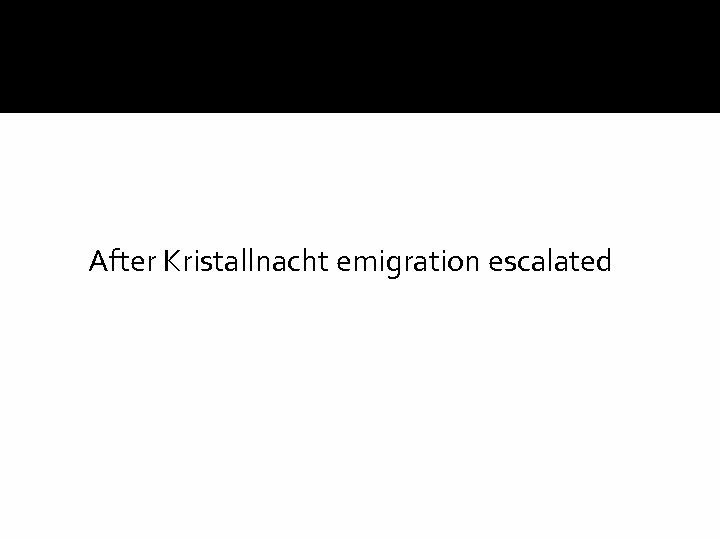 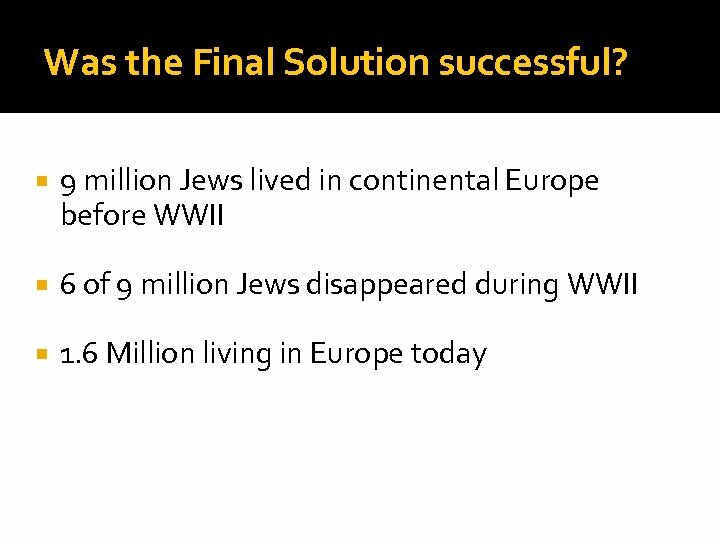 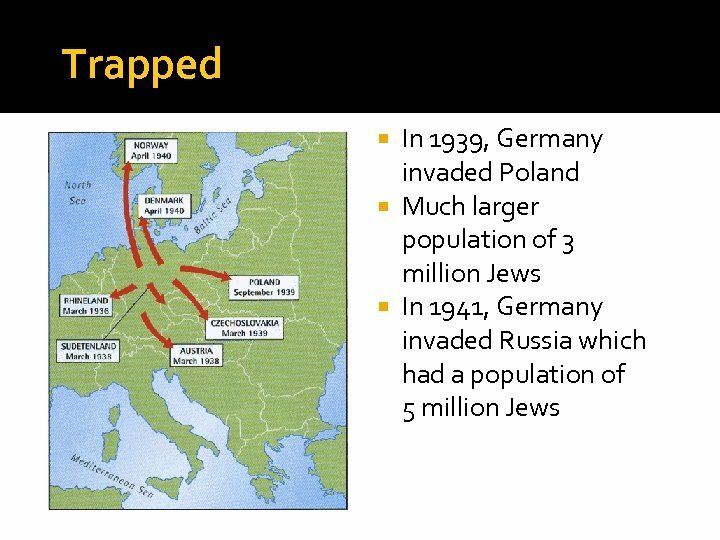 There were, however, 500, 000 Jews who seemed to threaten “racial purity”. 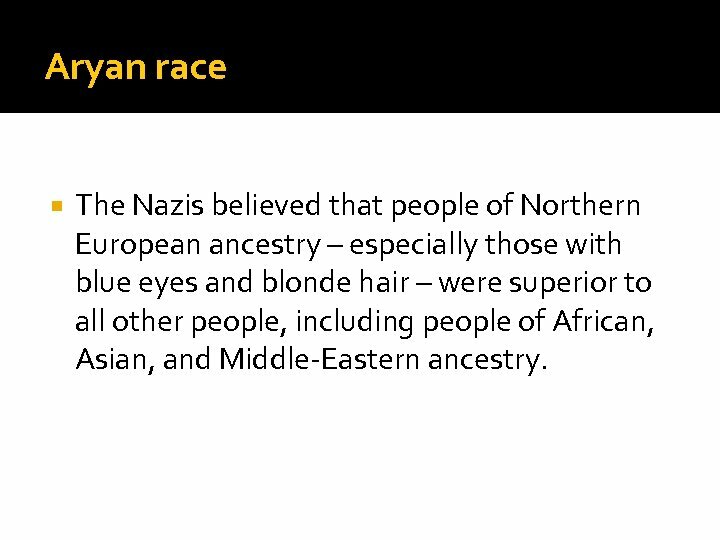 Aryan race The Nazis believed that people of Northern European ancestry – especially those with blue eyes and blonde hair – were superior to all other people, including people of African, Asian, and Middle-Eastern ancestry. 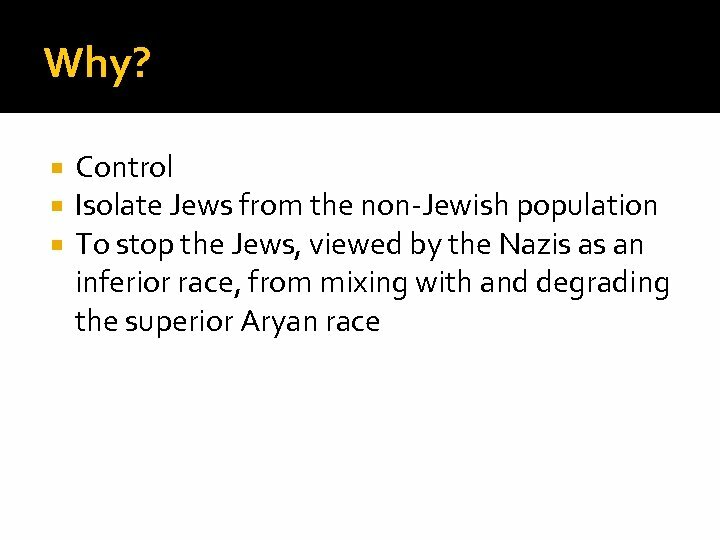 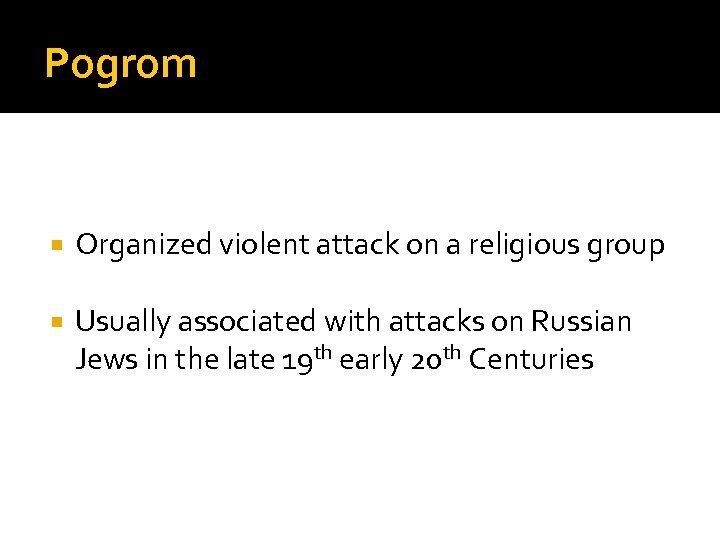 Categories Full Jews: They had at least three Jewish grandparents and practiced Judaism. 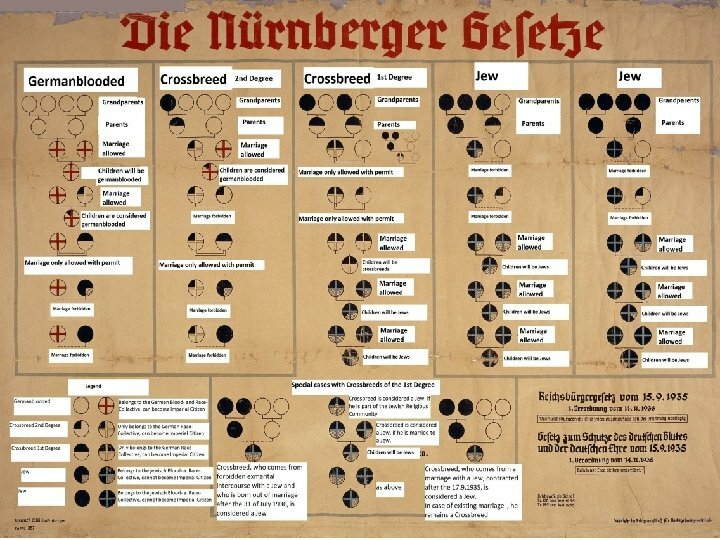 First Class Mischlinge; otherwise known as half Jewish: They did not practice Judaism, did not have a Jewish spouse and had two Jewish grandparents. 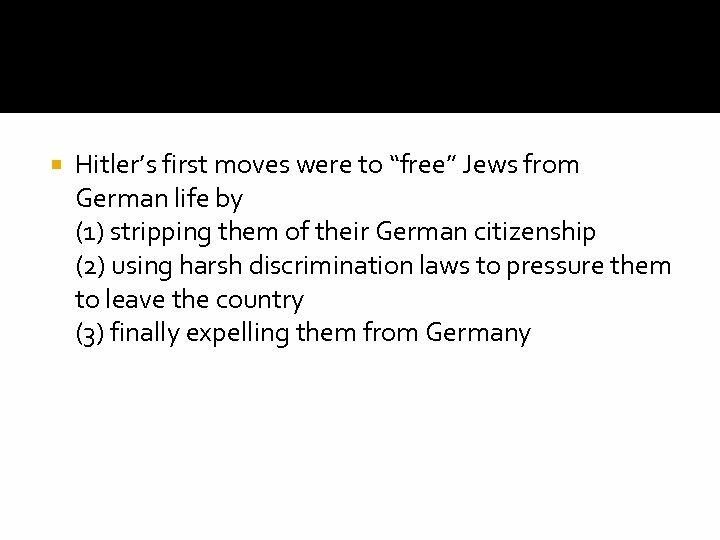 Second Class Mischlinge; otherwise known as one-quarter Jewish: They also did not practice Judaism and had one Jewish grandparent. 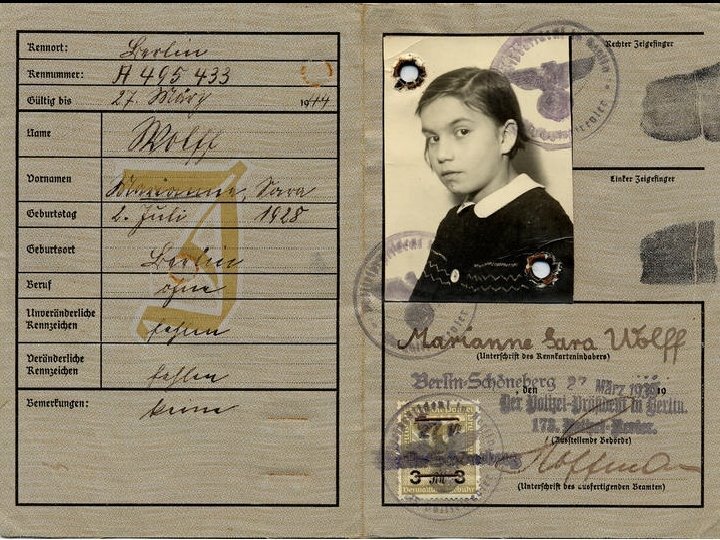 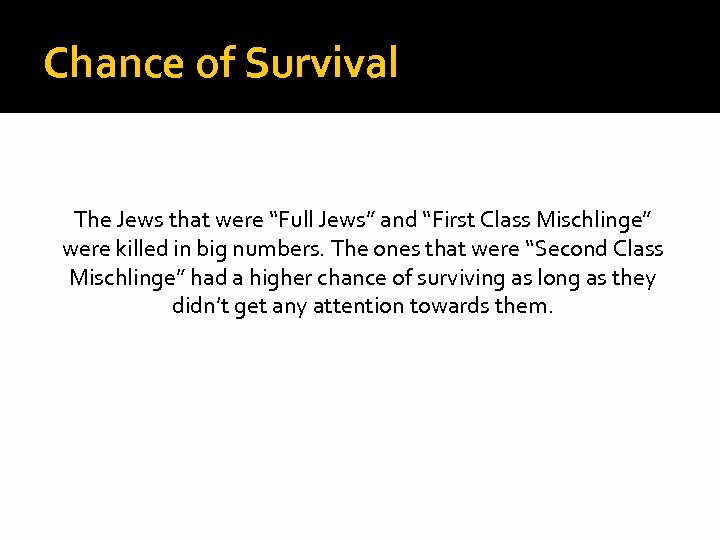 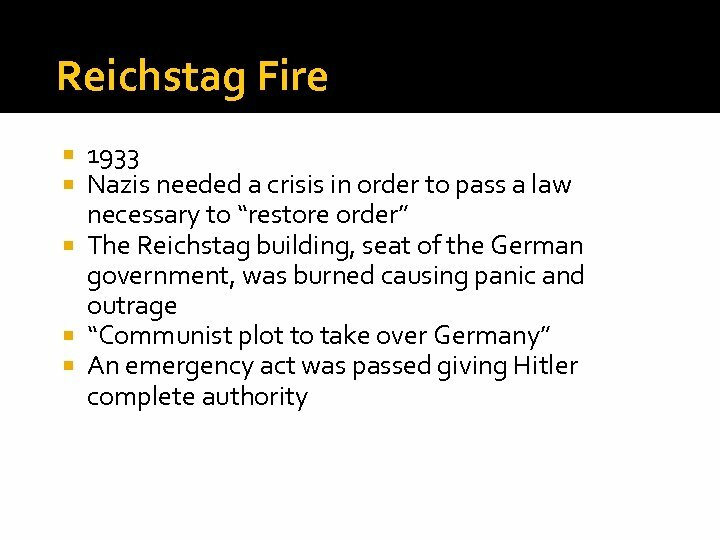 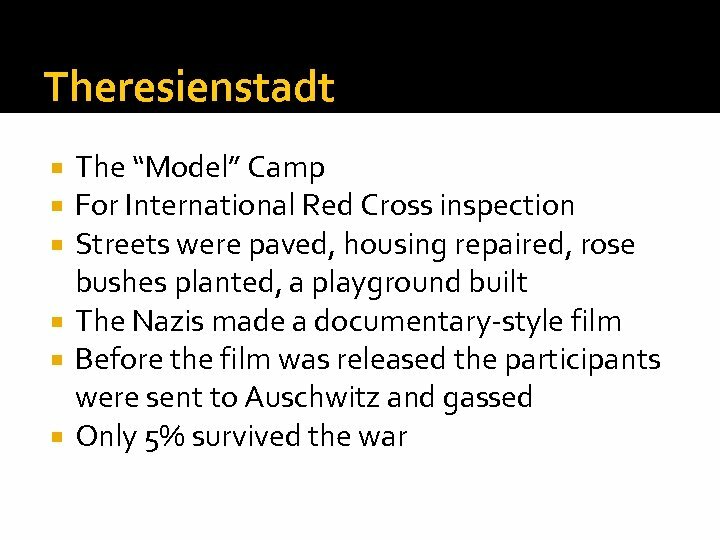 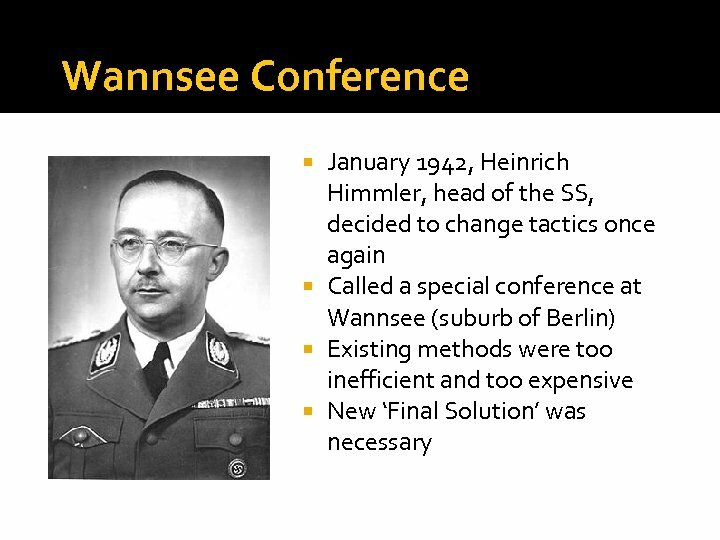 Chance of Survival The Jews that were “Full Jews” and “First Class Mischlinge” were killed in big numbers. 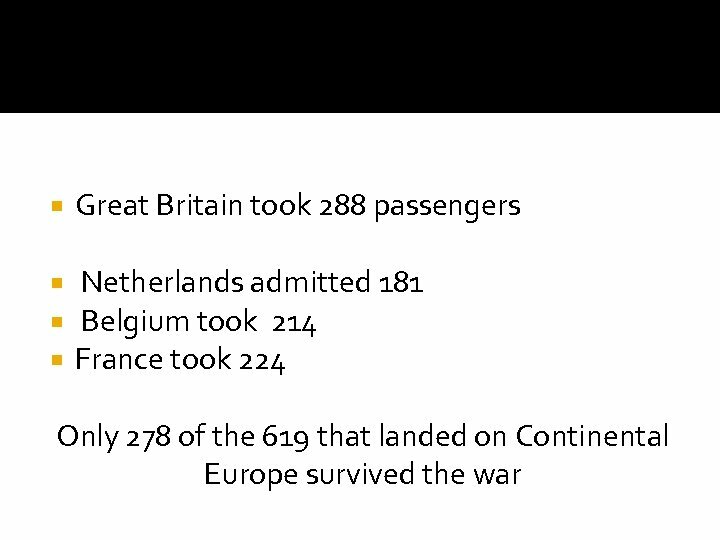 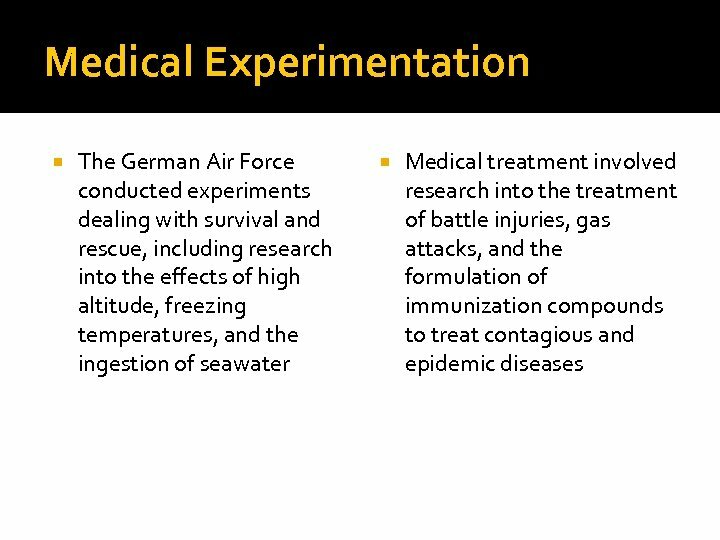 The ones that were “Second Class Mischlinge” had a higher chance of surviving as long as they didn’t get any attention towards them. 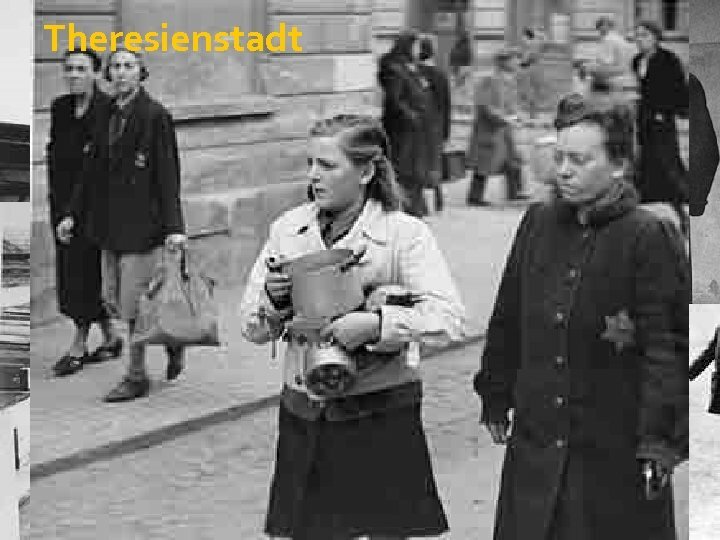 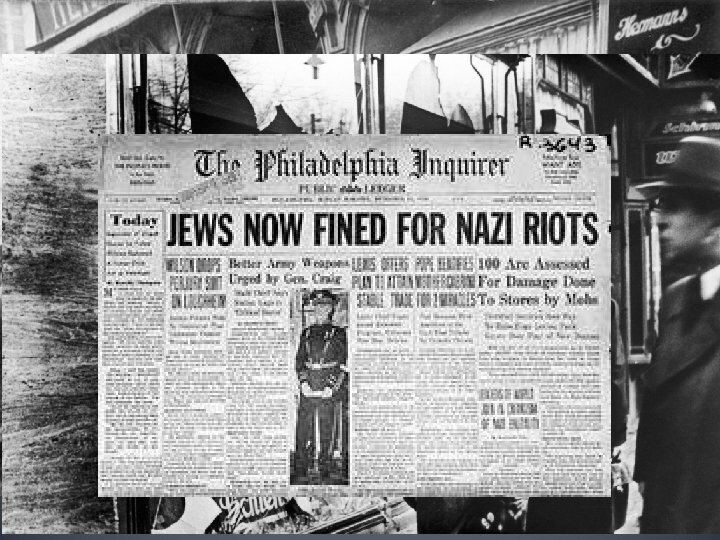 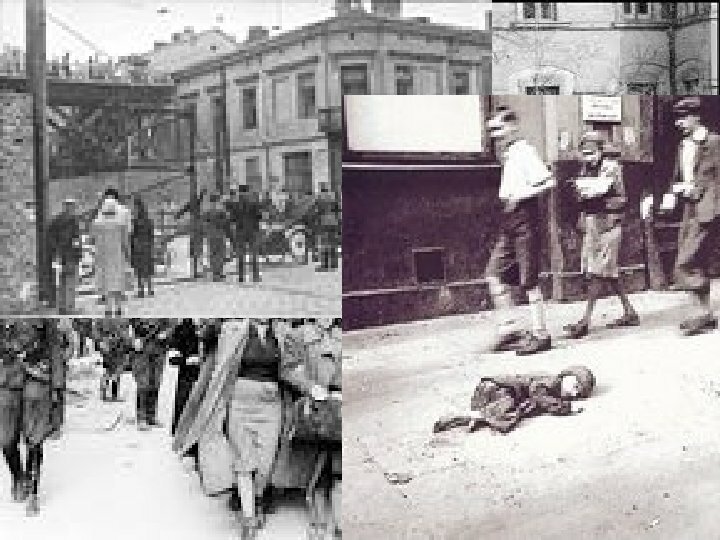 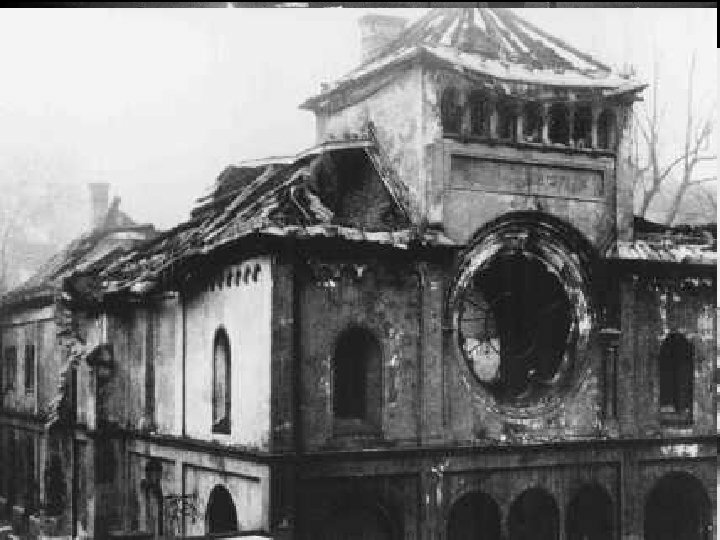 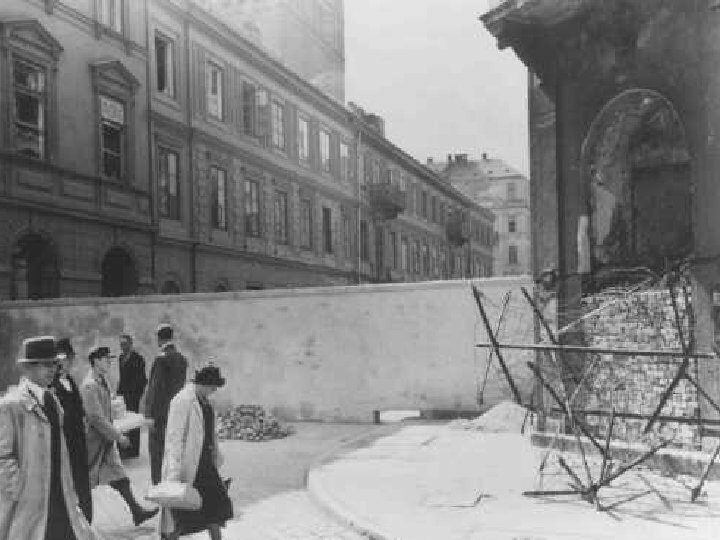 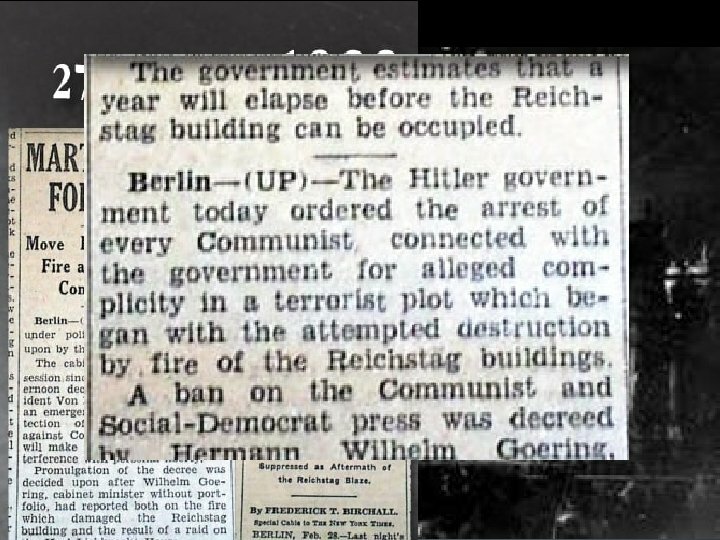 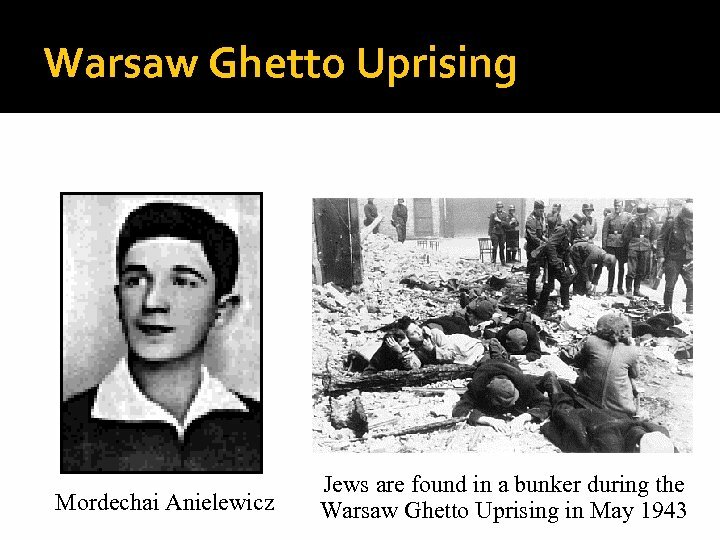 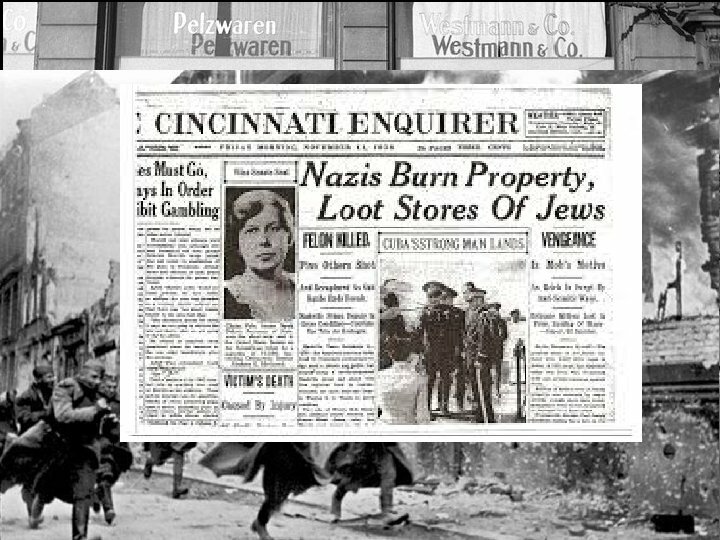 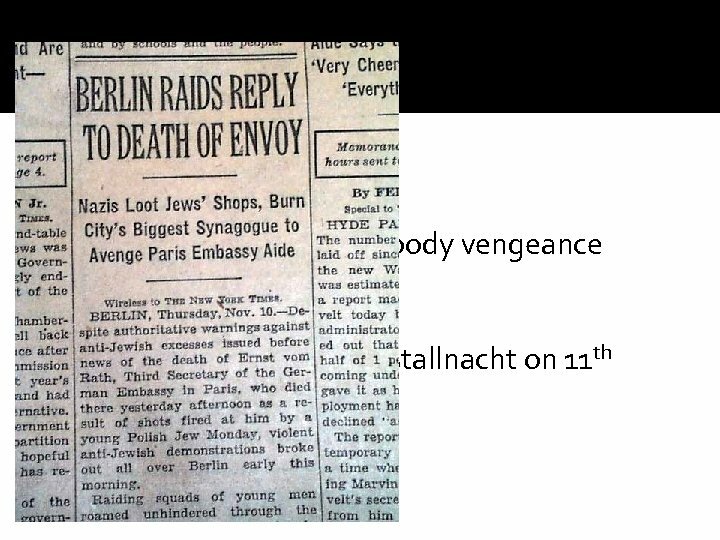 For the next 24 hours Nazi Stormtroopers, SS, and Hitler Youth beat and murdered Jews, broke into and wrecked Jewish homes, brutalized Jewish women and children, destroyed 265 synagogues, looted 7, 500 Jewish businesses, smashed Jewish cemeteries, hospitals and schools. 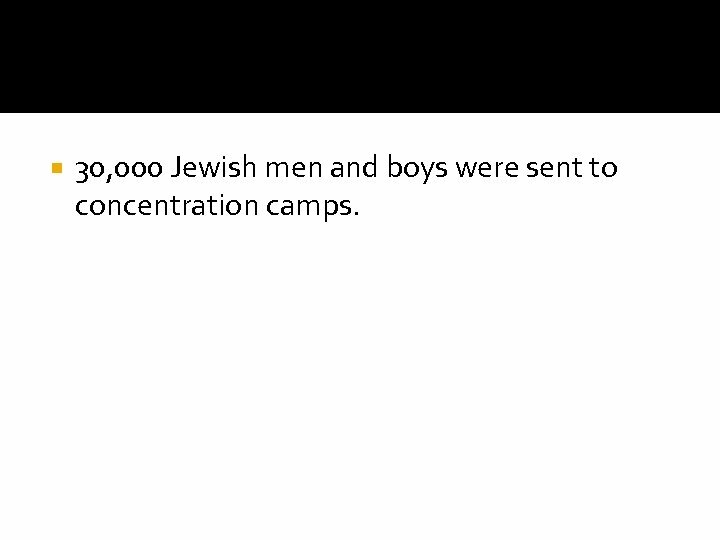 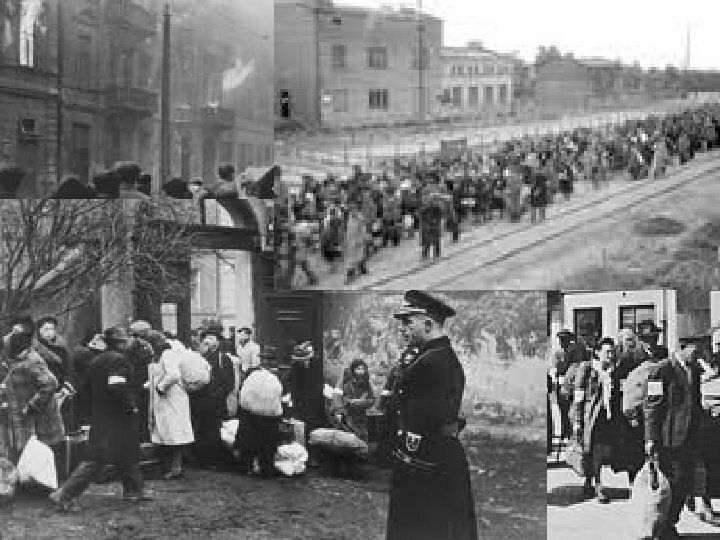 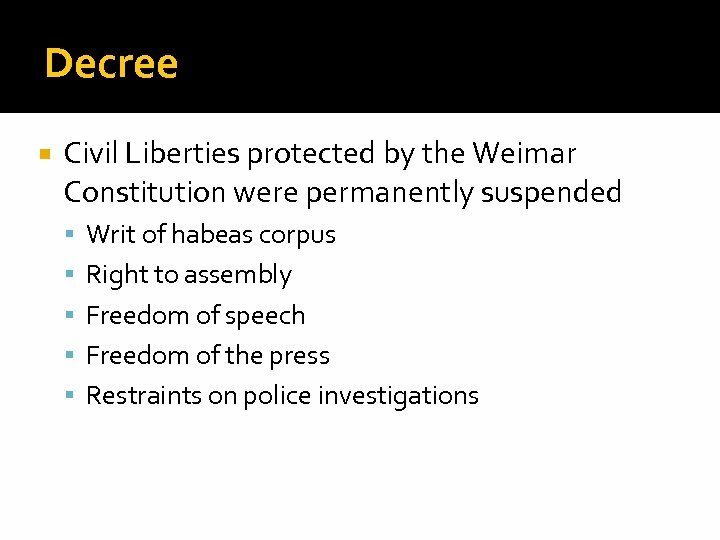 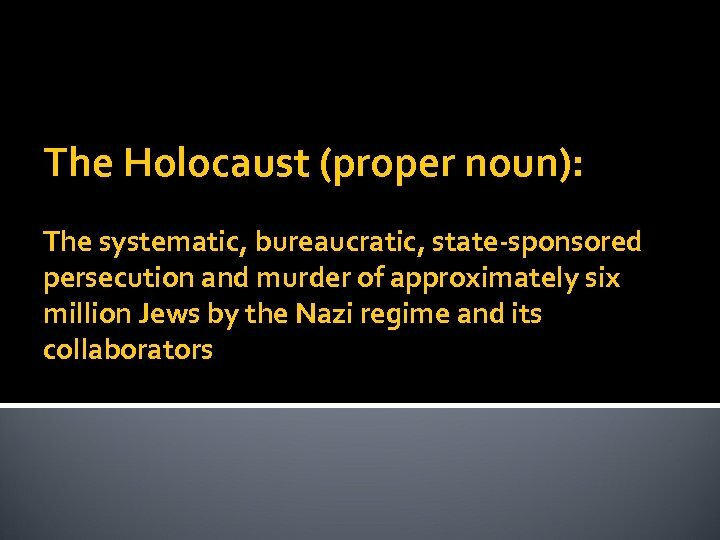 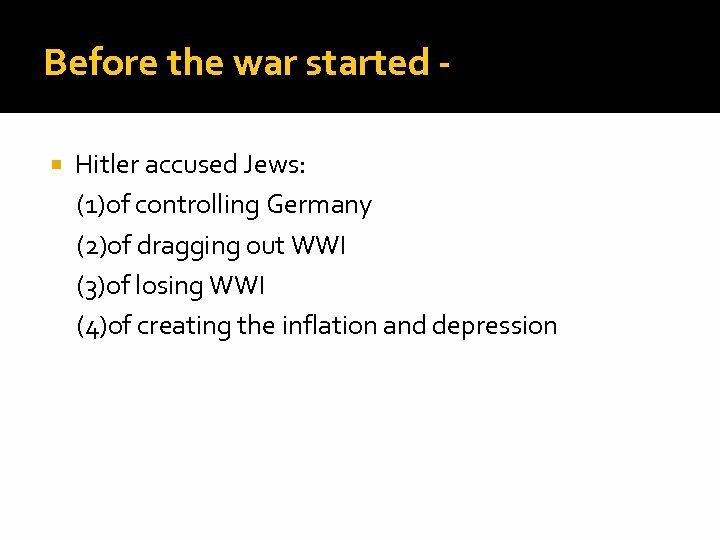 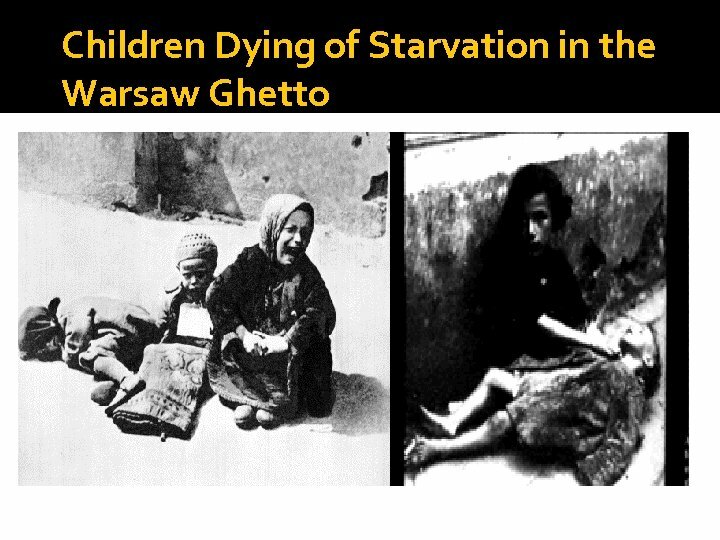 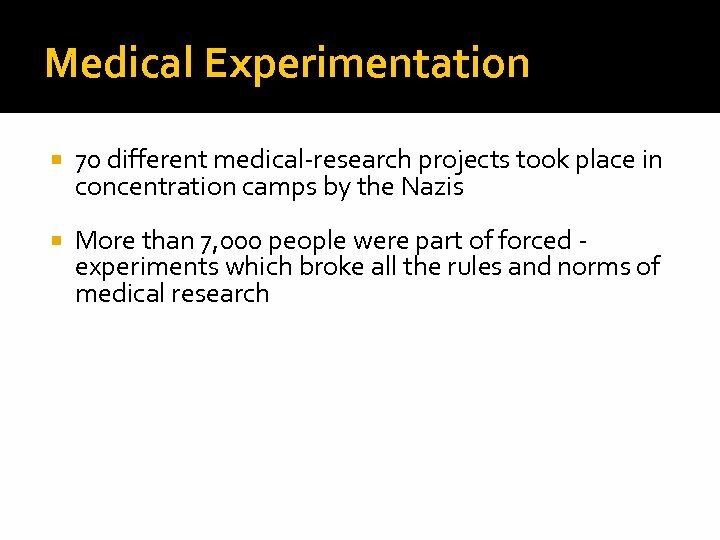 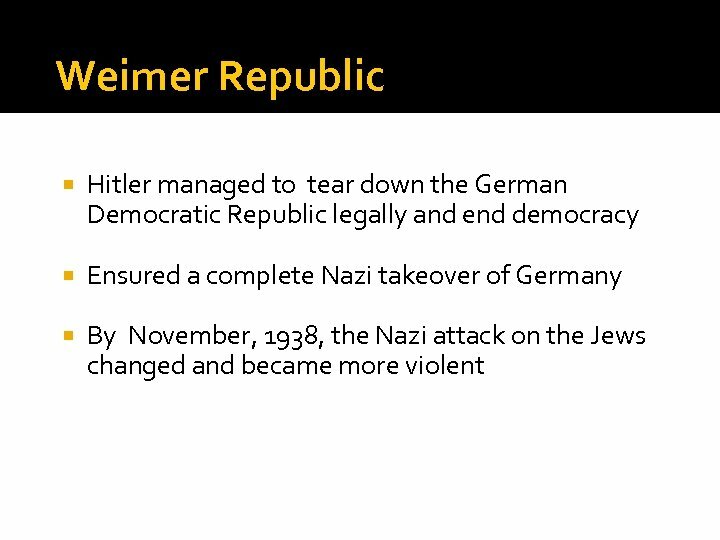 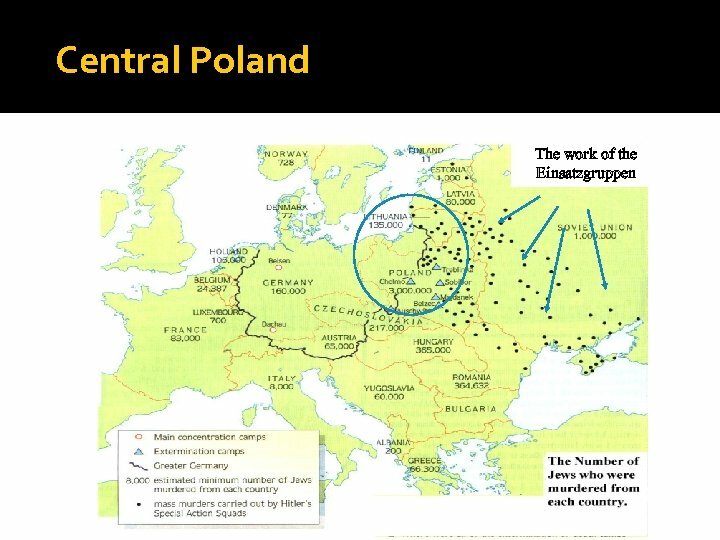 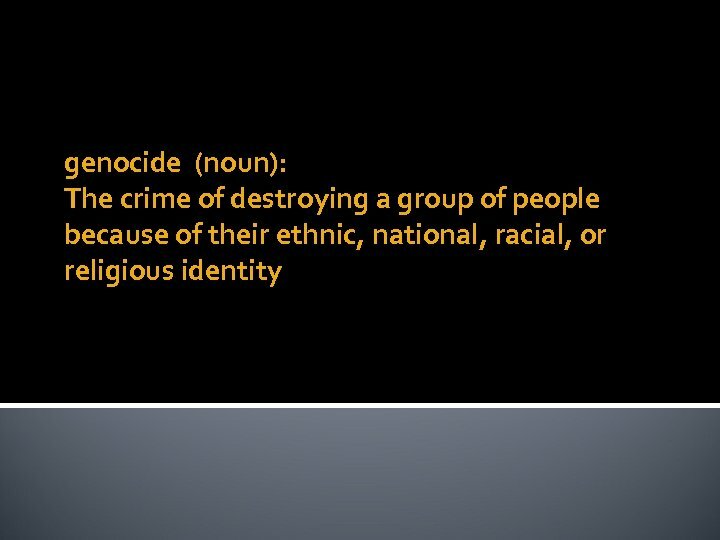 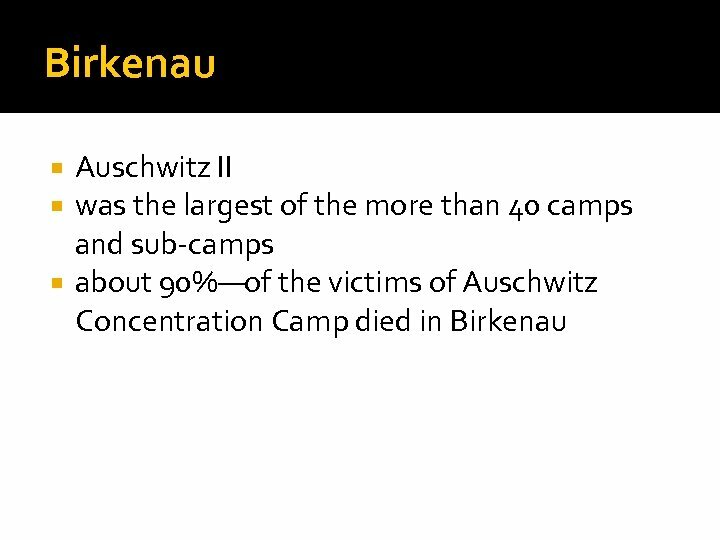 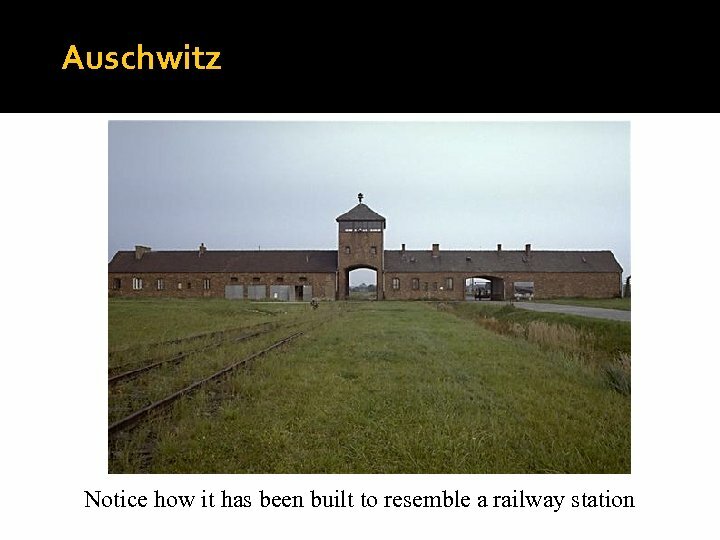 30, 000 Jewish men and boys were sent to concentration camps. 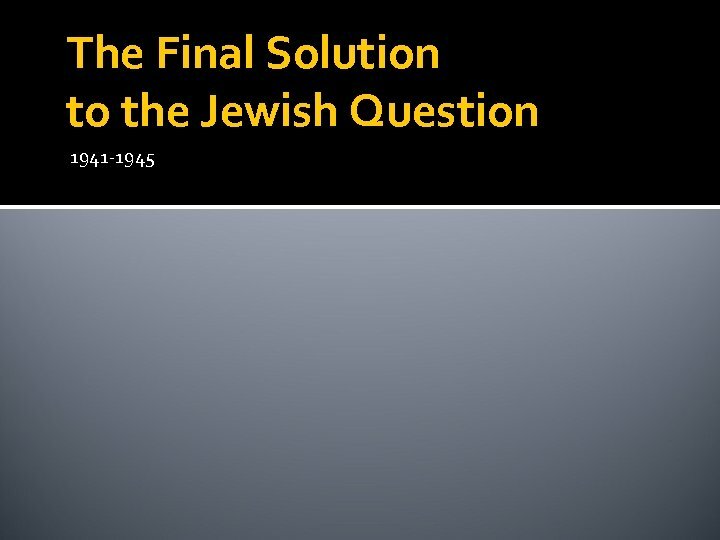 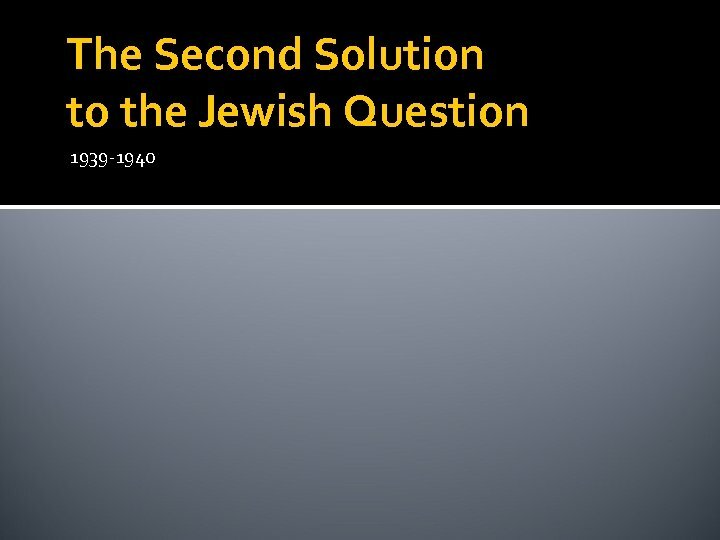 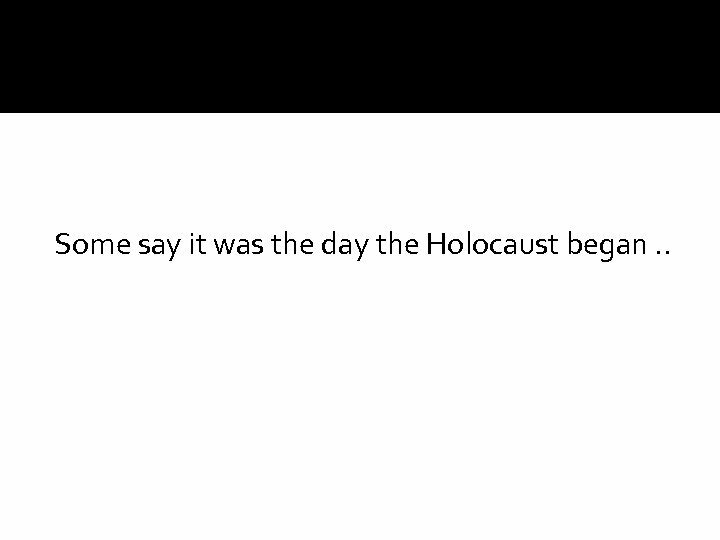 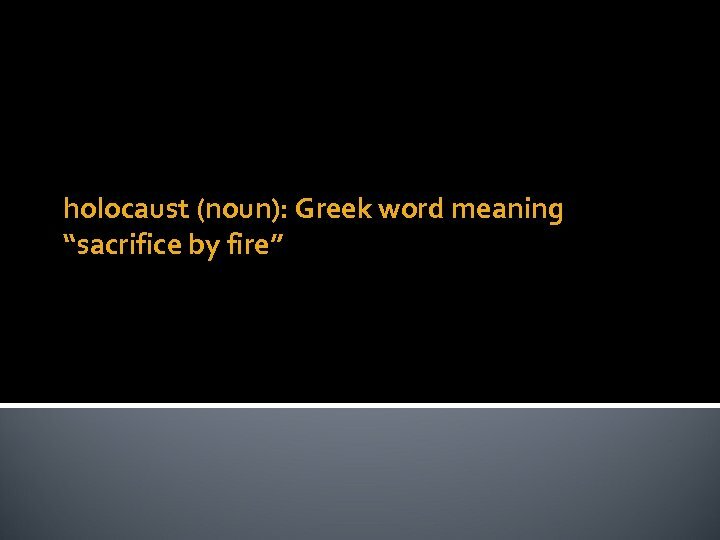 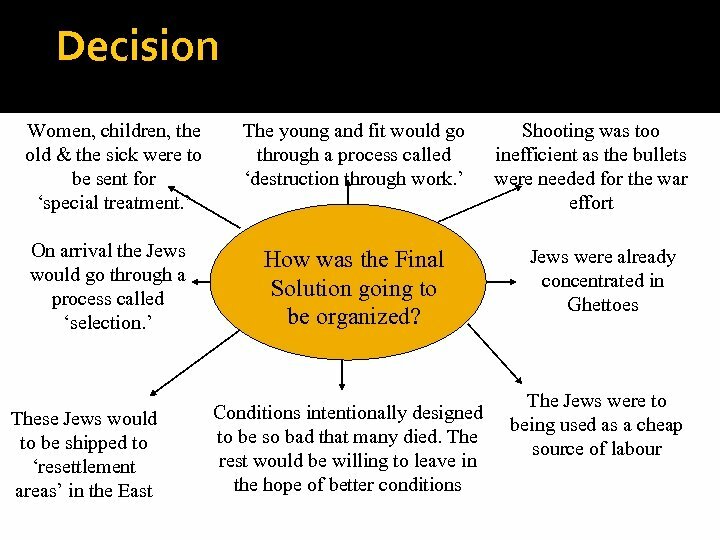 Some say it was the day the Holocaust began. .
Why? 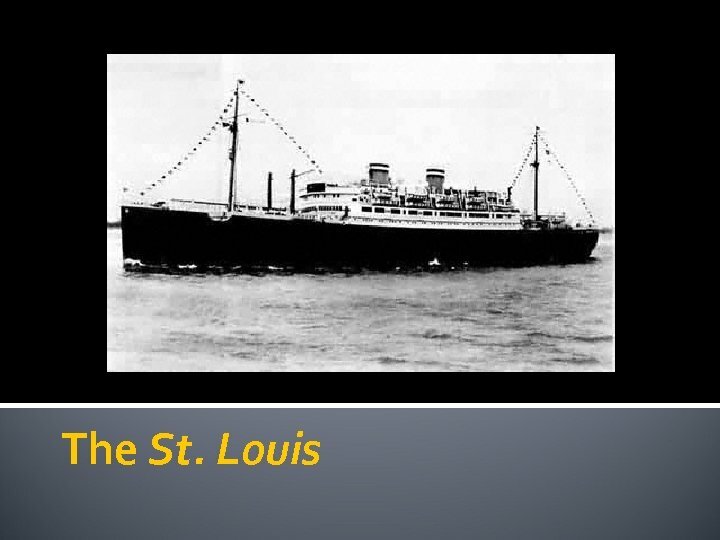 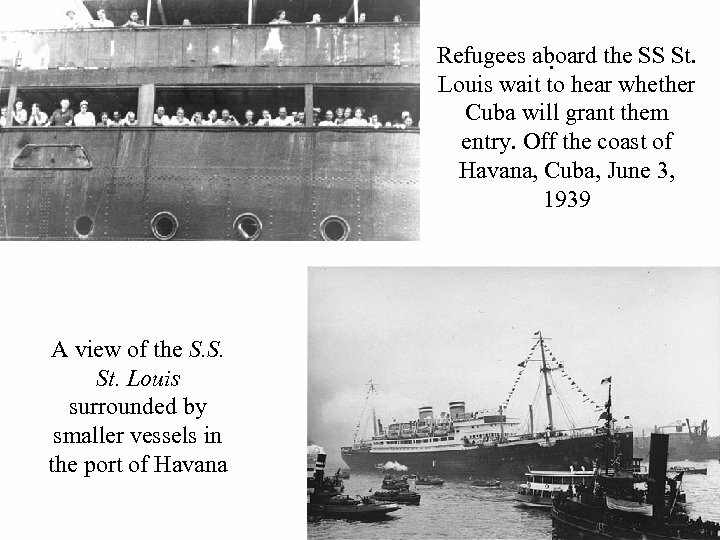 As the boat Joseph Goebbels had approached Havana, decided to use the S. S. the Cuban government St. Louis and her declared the visas passengers in a master invalid and refused propaganda plan. 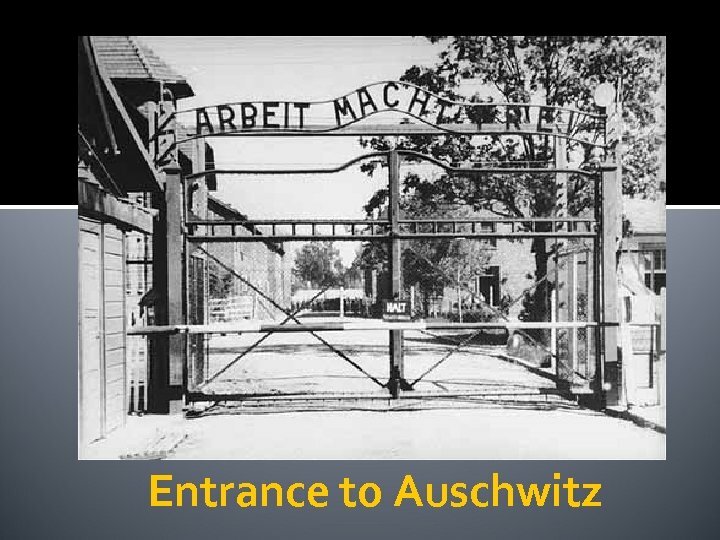 entry to the passengers. 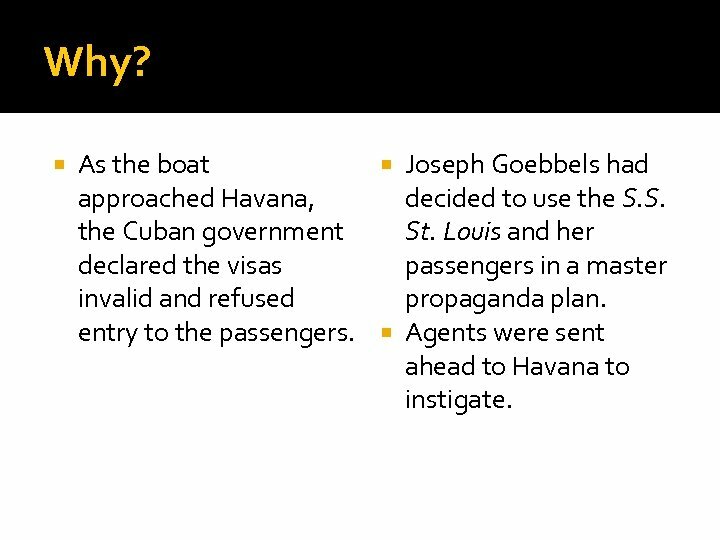 Agents were sent ahead to Havana to instigate. 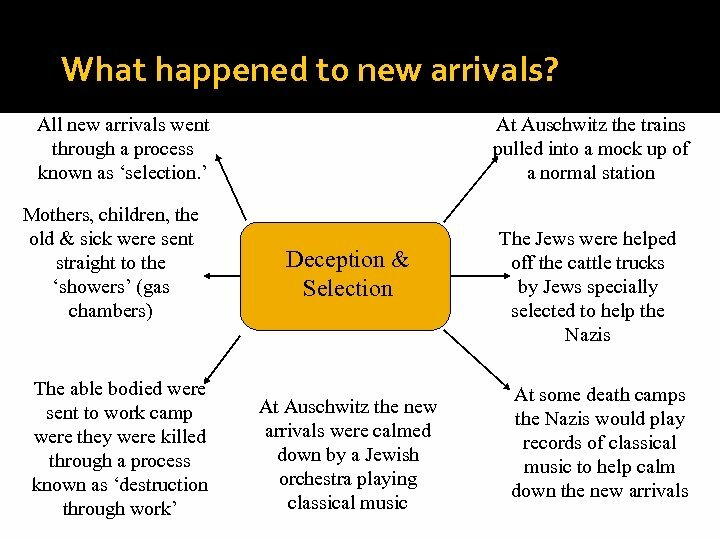 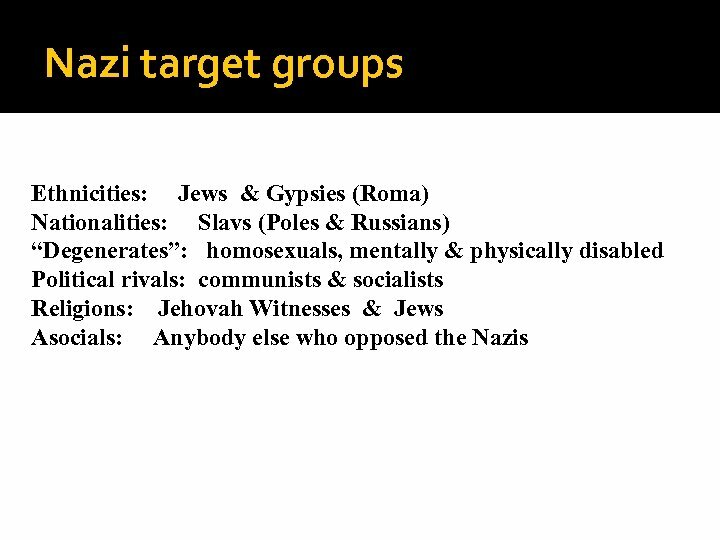 Nazi propaganda fabricated and hyped the Jewish passengers' criminal nature - making them seem dangerous and undesirable. 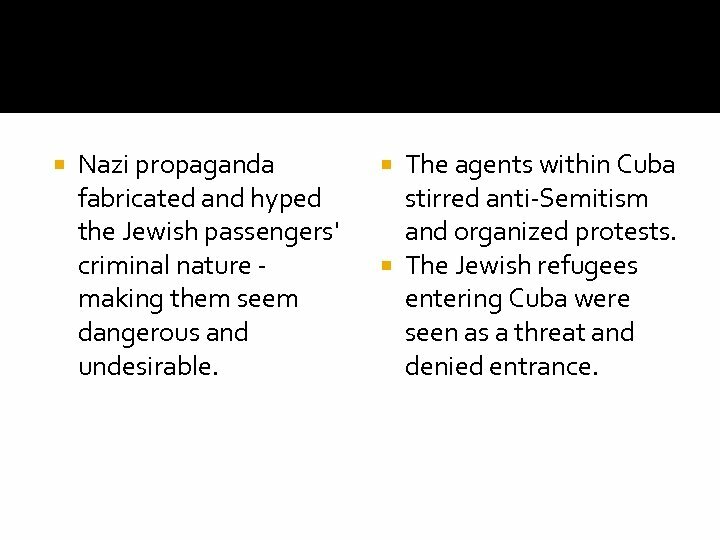 The agents within Cuba stirred anti-Semitism and organized protests. 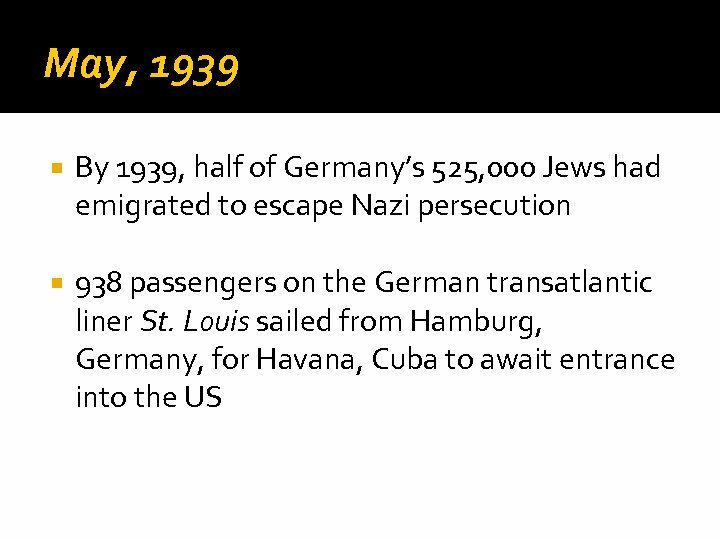 The Jewish refugees entering Cuba were seen as a threat and denied entrance. 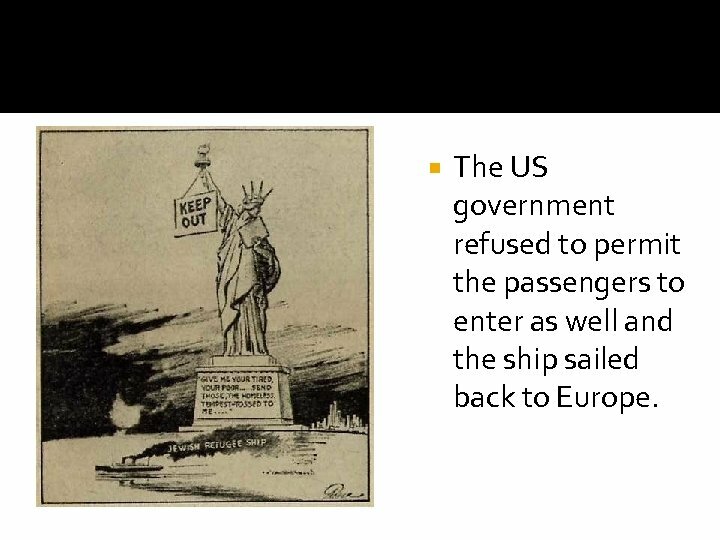 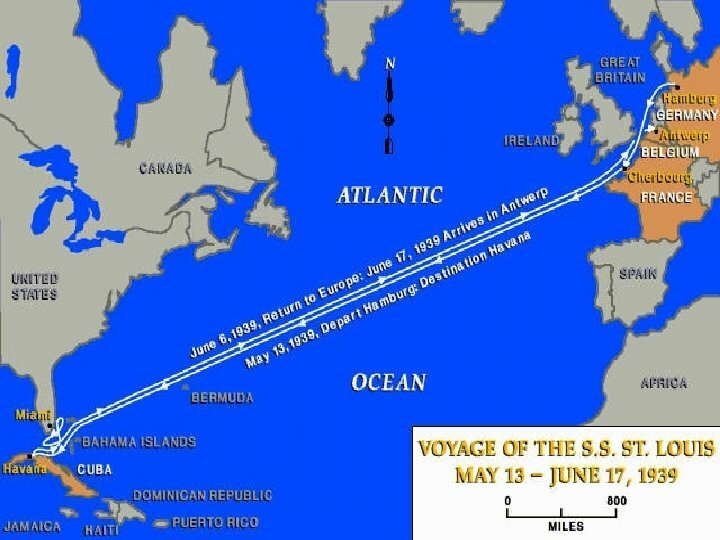 The US government refused to permit the passengers to enter as well and the ship sailed back to Europe. 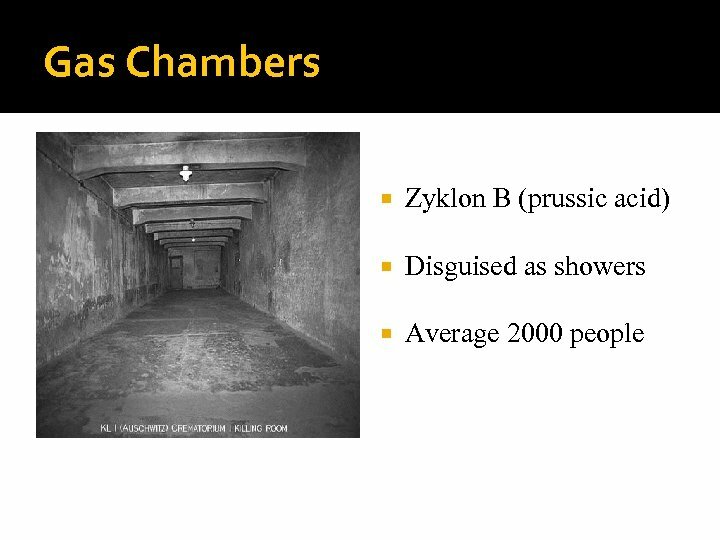 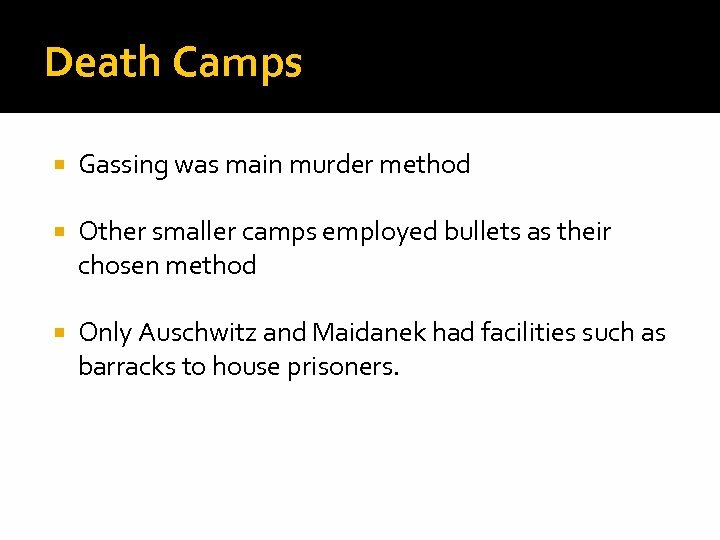 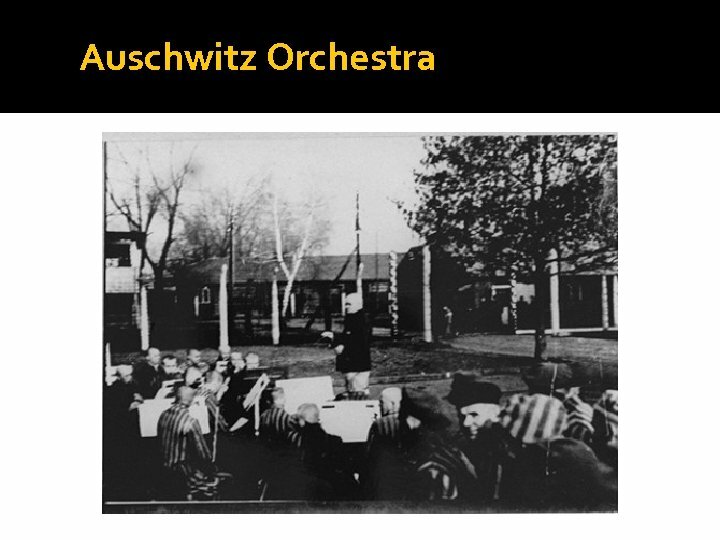 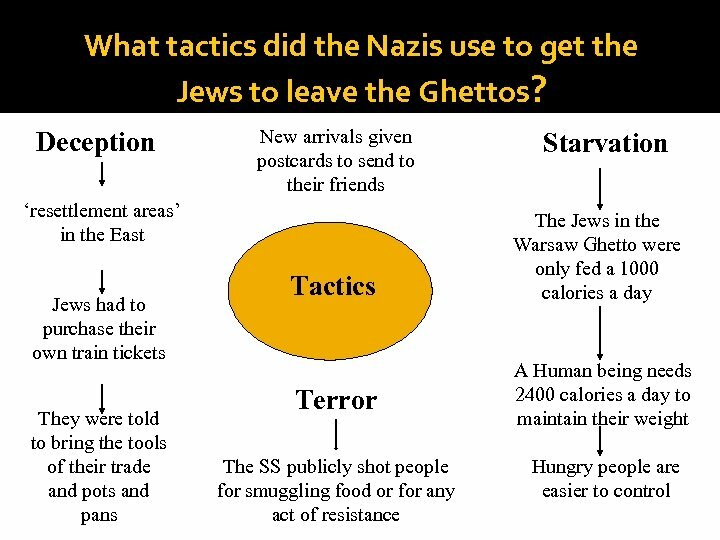 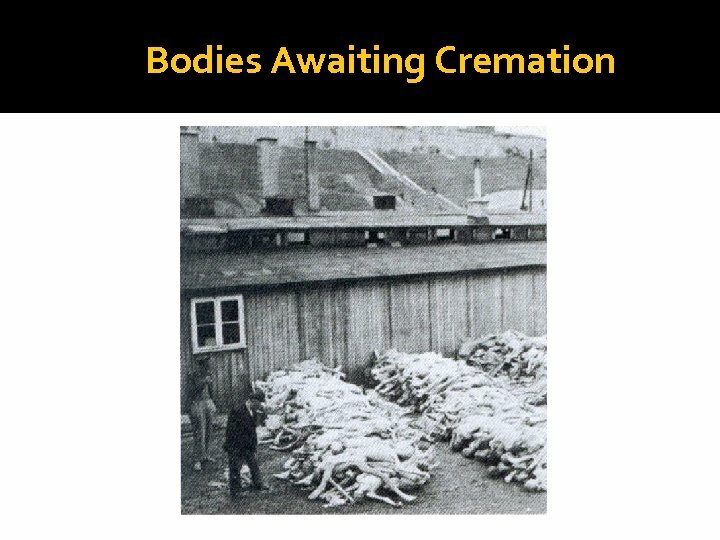 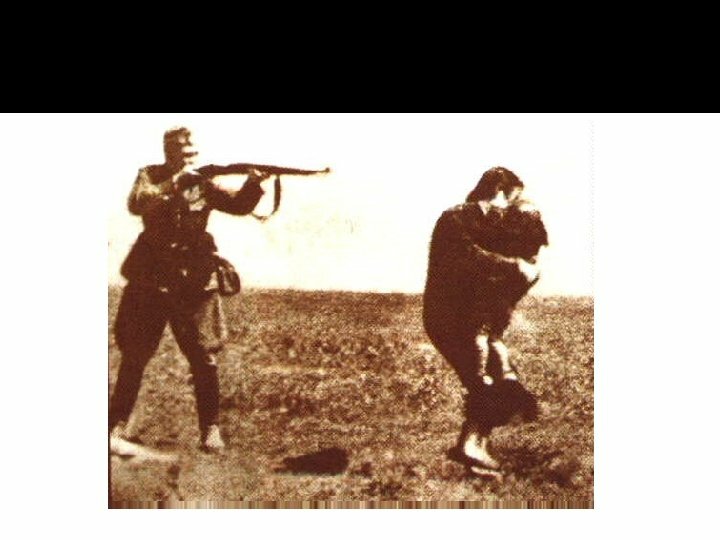 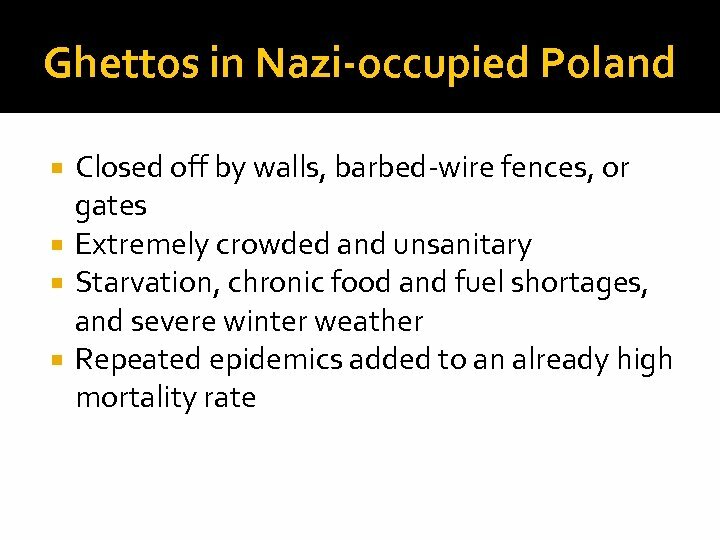 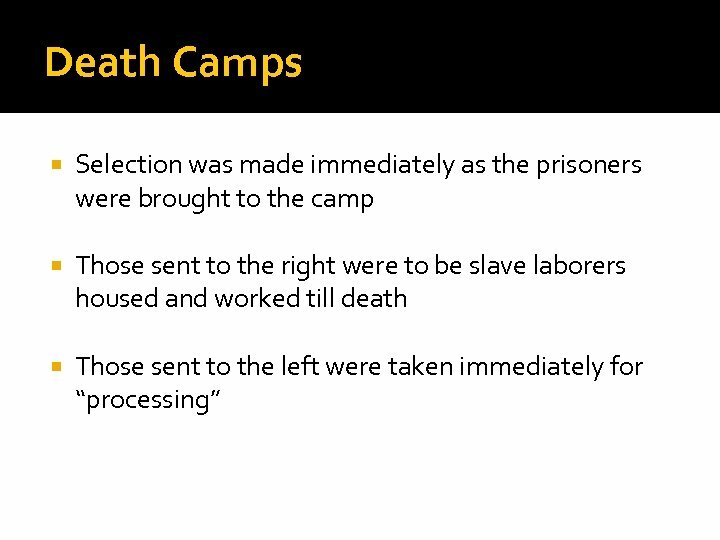 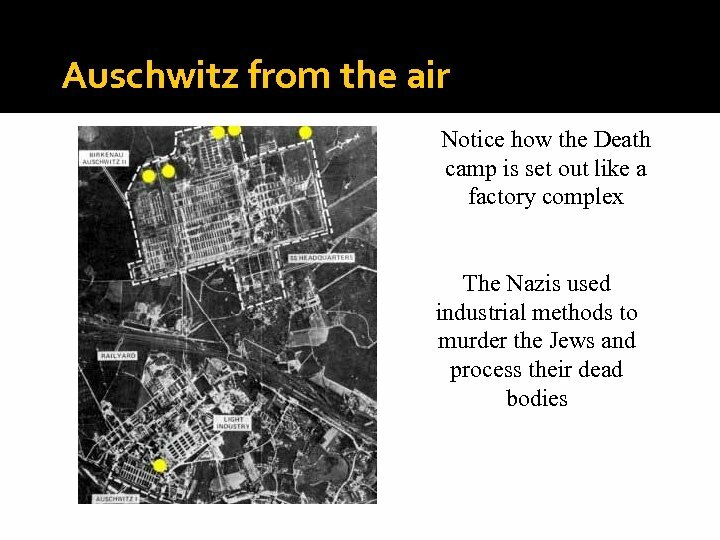 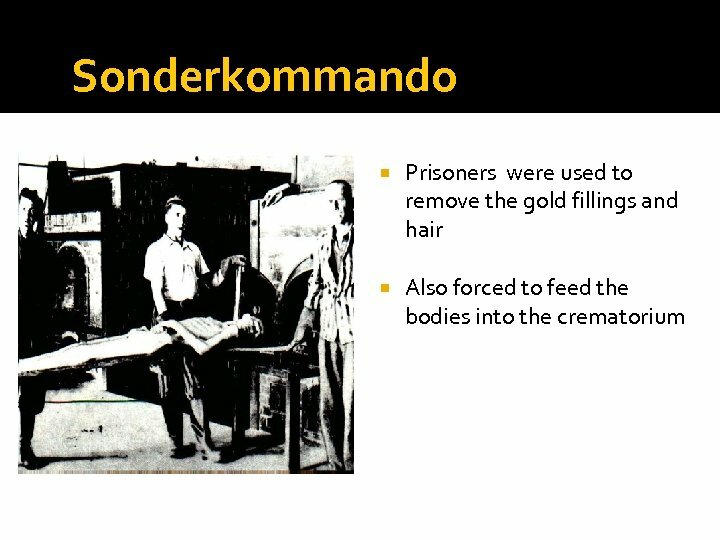 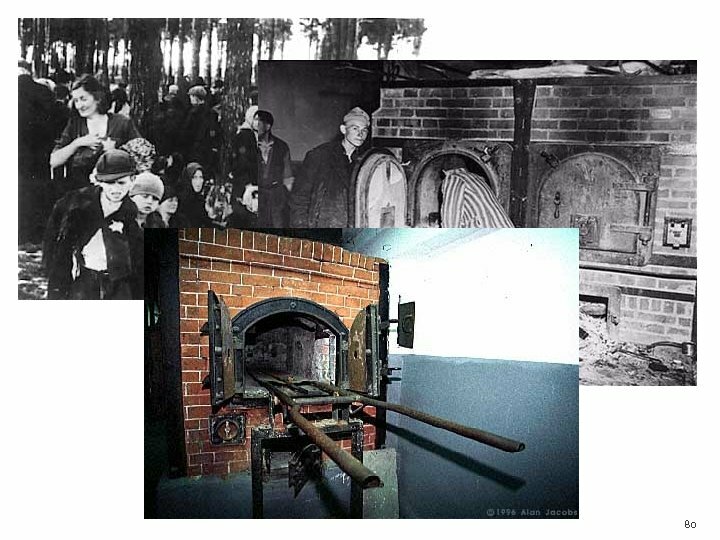 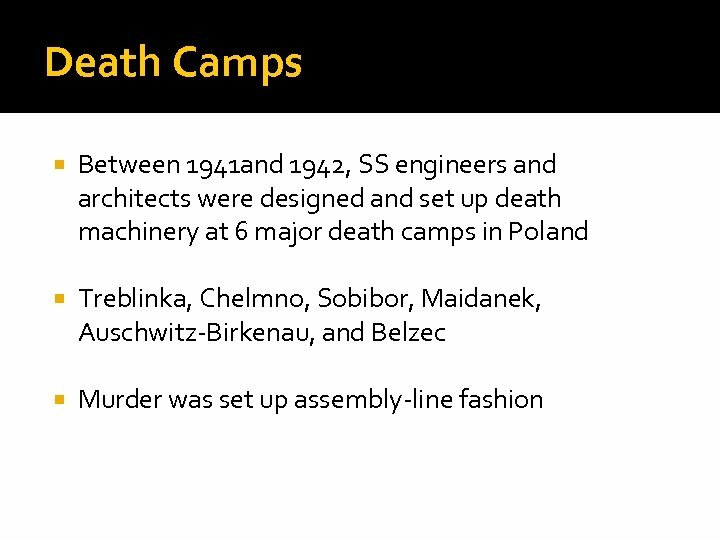 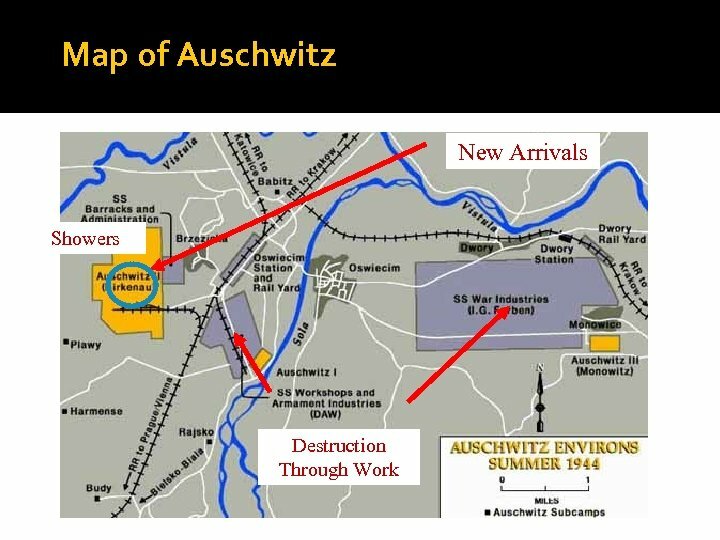 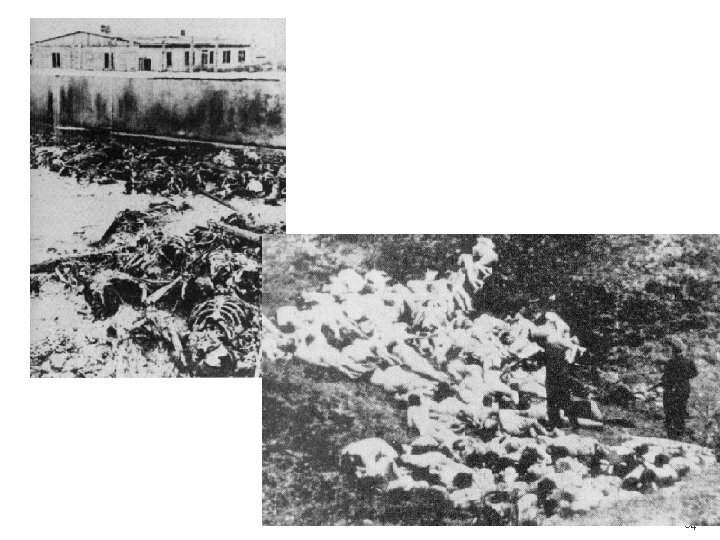 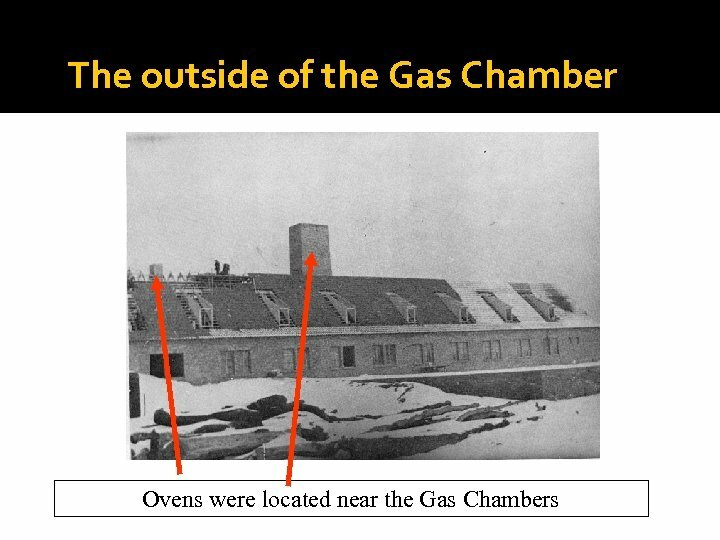 Death Camps Gassing was main murder method Other smaller camps employed bullets as their chosen method Only Auschwitz and Maidanek had facilities such as barracks to house prisoners. 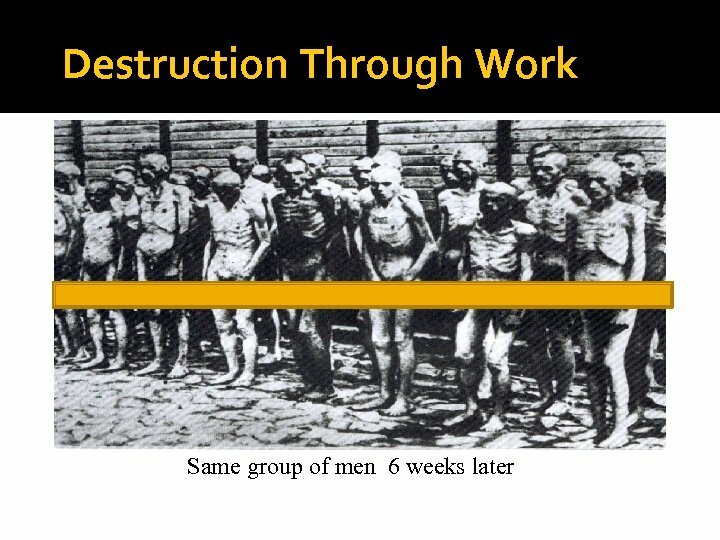 How can one human do that to another? 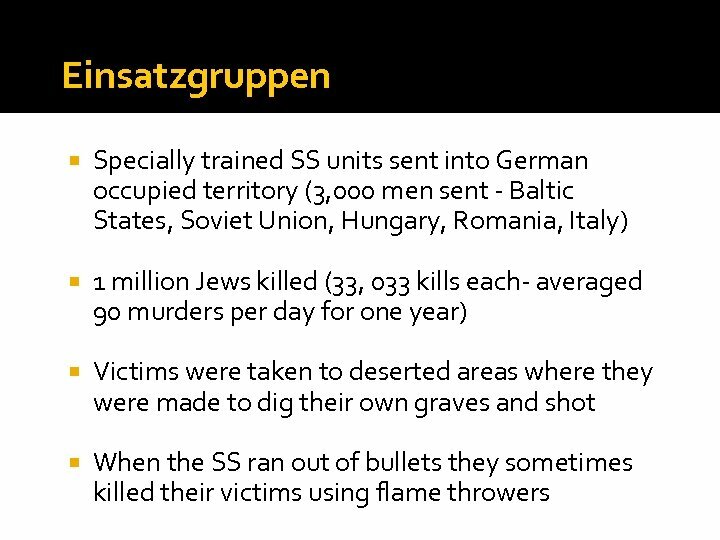 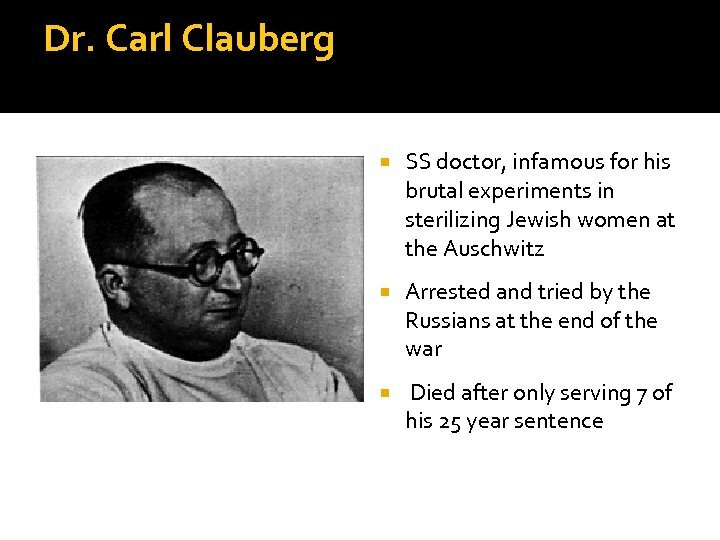 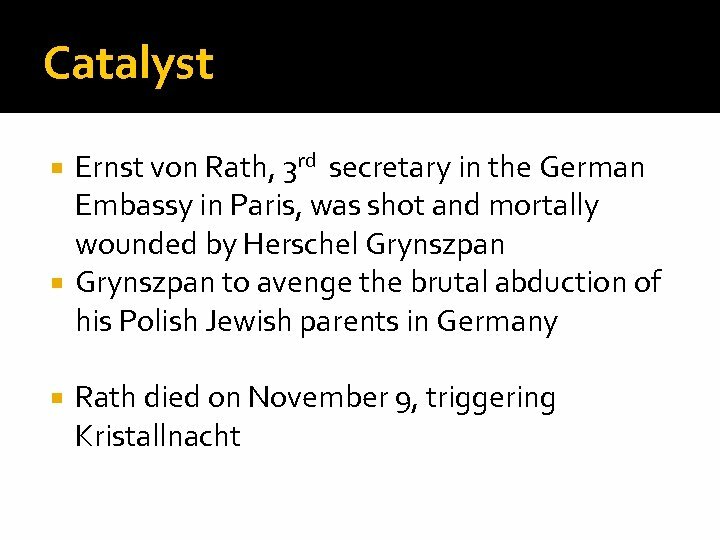 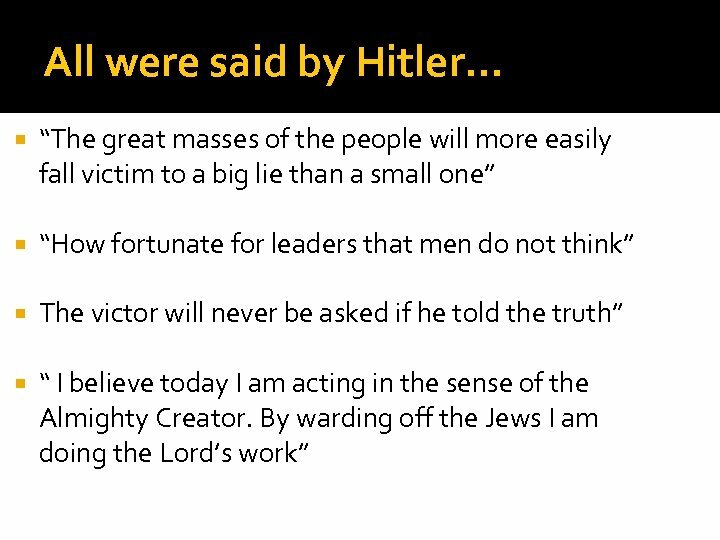 The SS guards who murdered the Jews were brainwashed with Anti-Semitic propaganda. 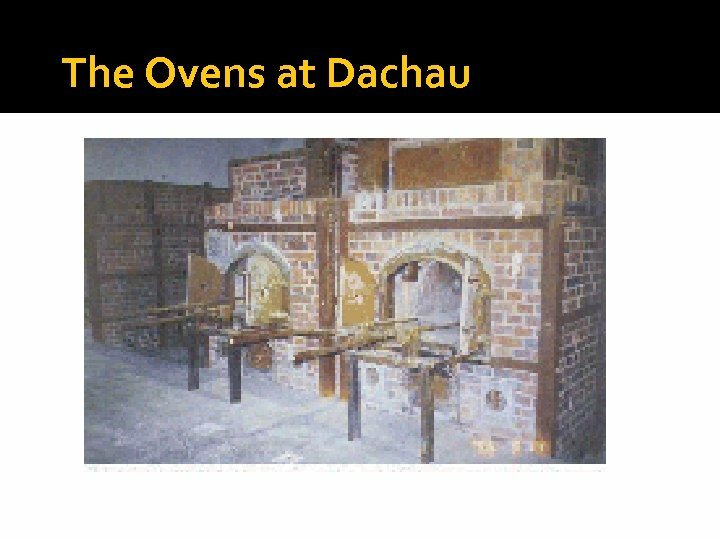 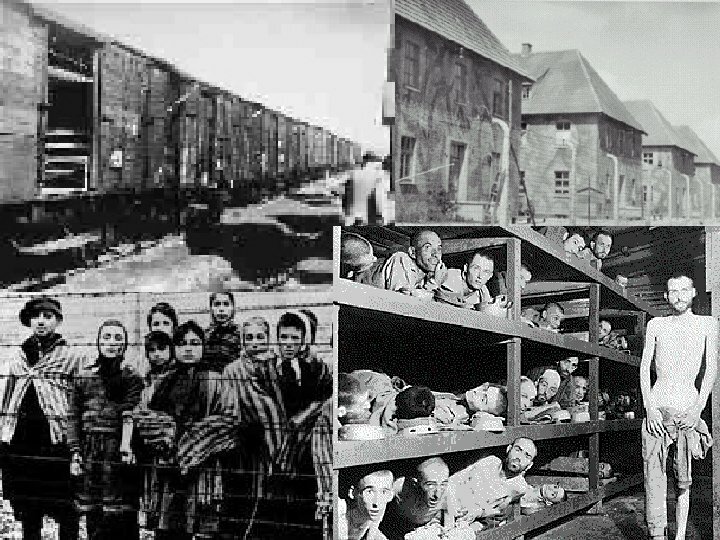 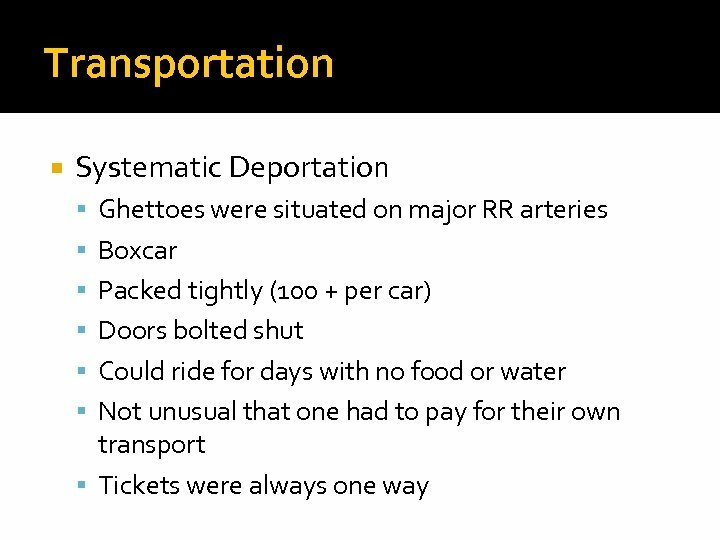 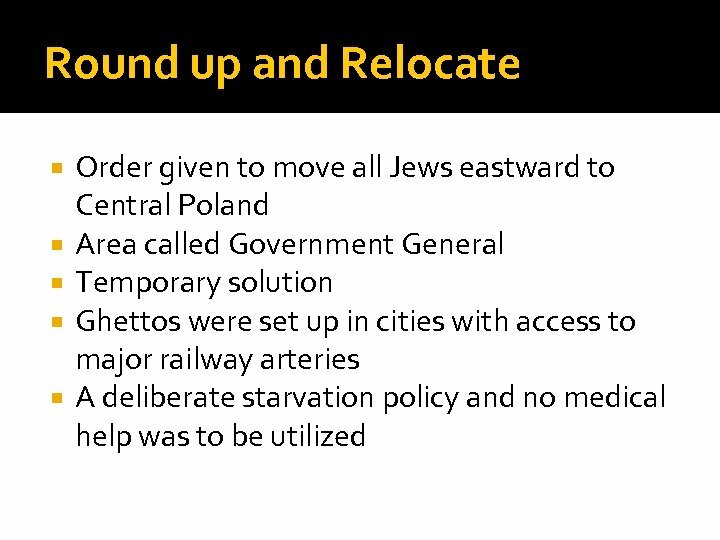 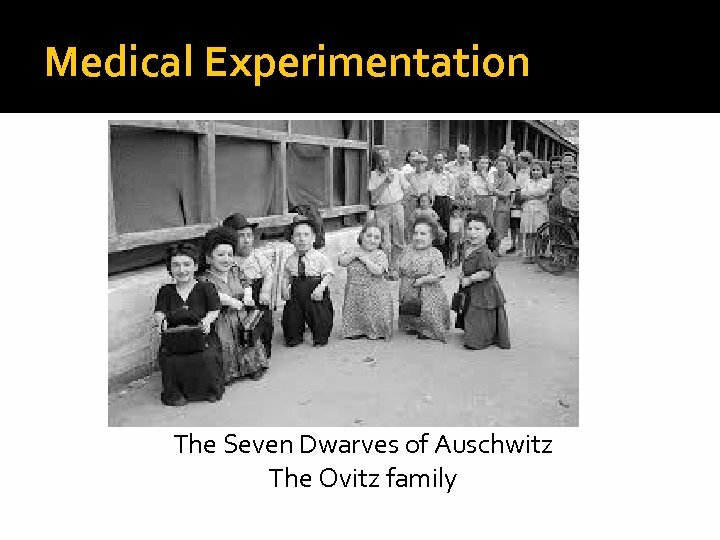 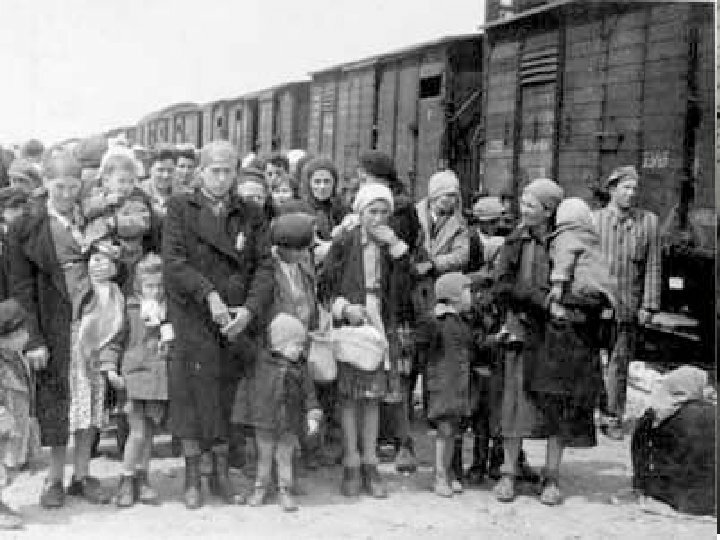 The Jews were transported in cattle cars in terrible conditions. 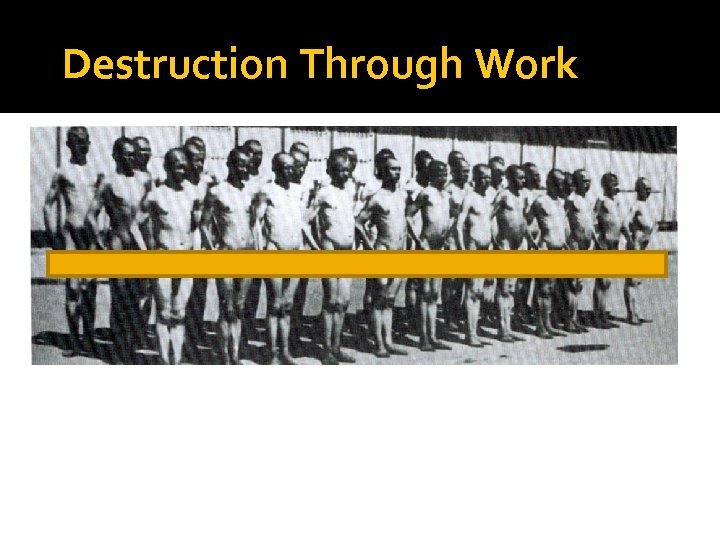 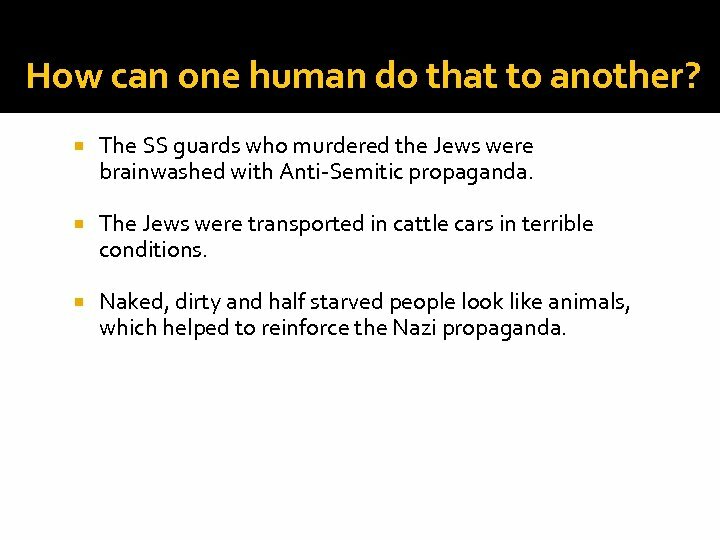 Naked, dirty and half starved people look like animals, which helped to reinforce the Nazi propaganda. 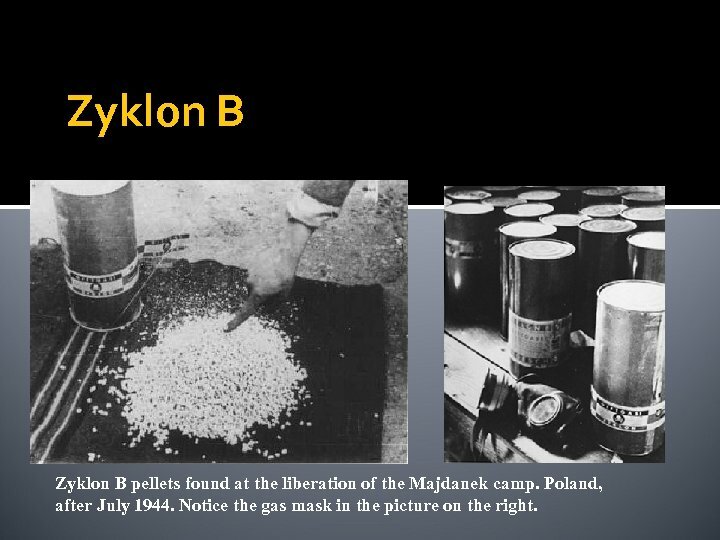 Zyklon B pellets found at the liberation of the Majdanek camp. 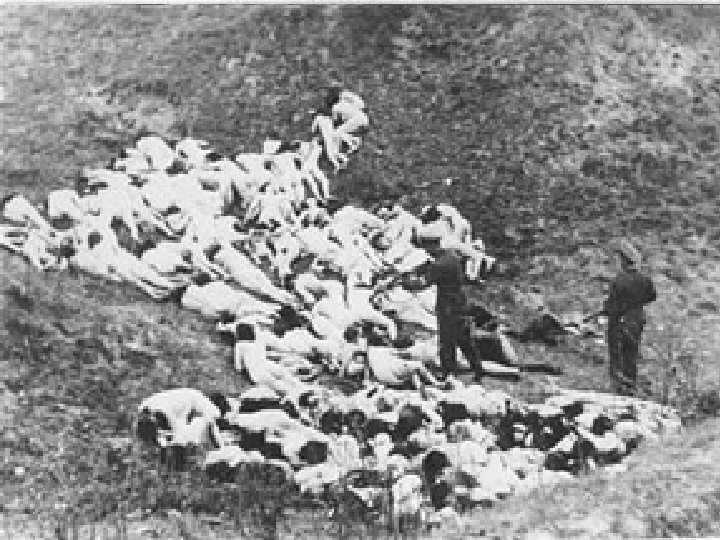 Poland, after July 1944. 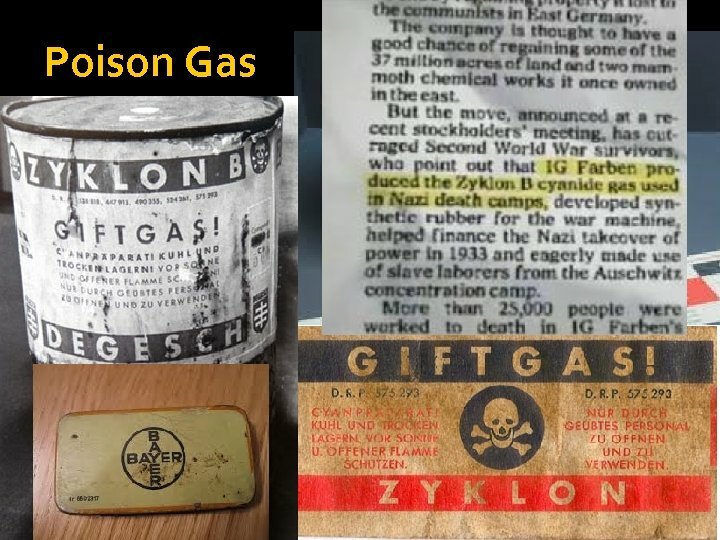 Notice the gas mask in the picture on the right. 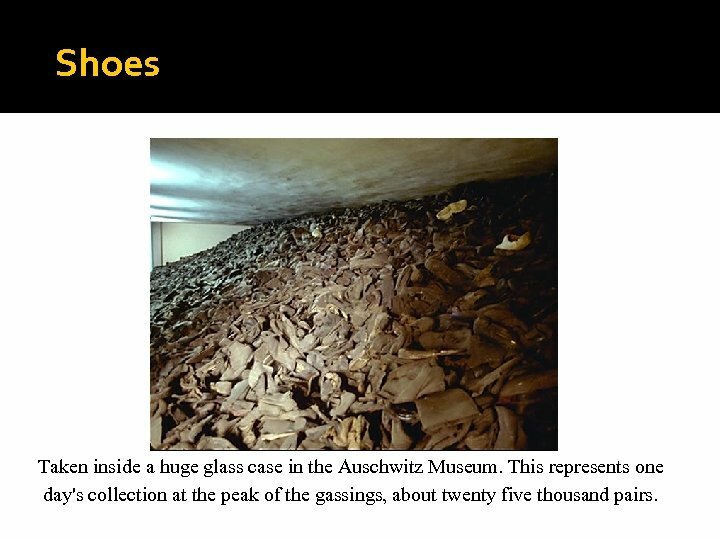 Shoes Taken inside a huge glass case in the Auschwitz Museum. 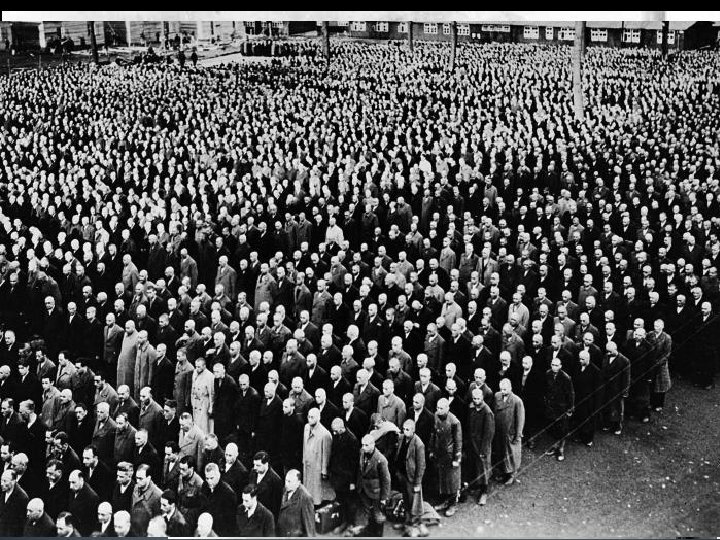 This represents one day's collection at the peak of the gassings, about twenty five thousand pairs. 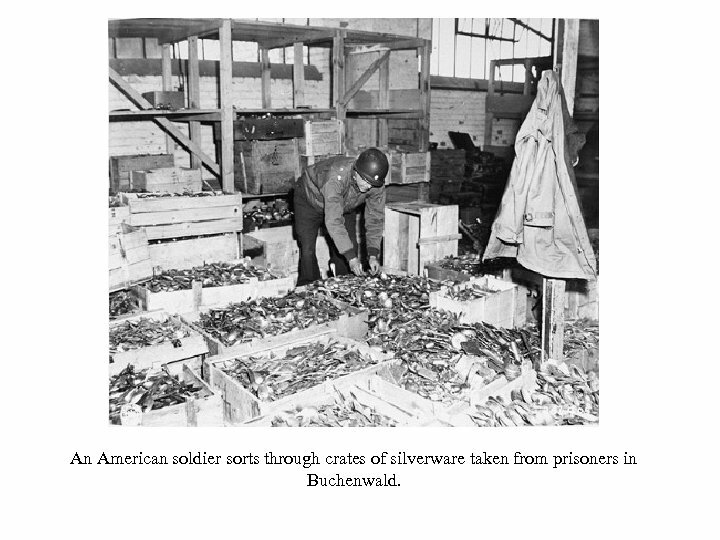 An American soldier sorts through crates of silverware taken from prisoners in Buchenwald. 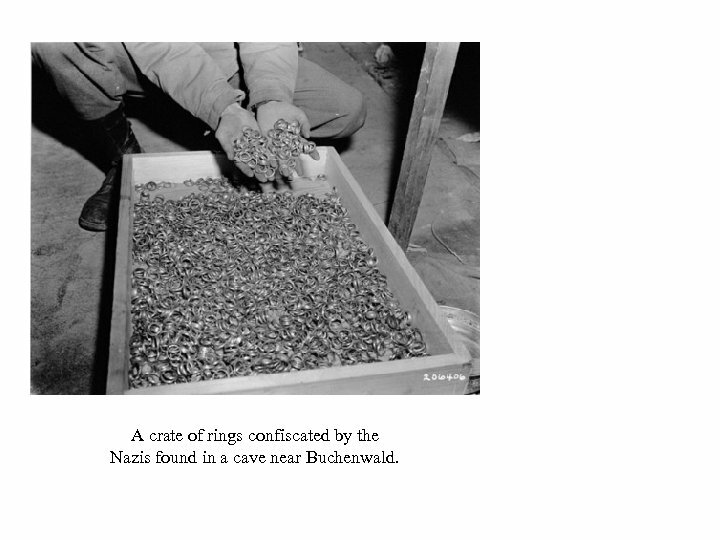 A crate of rings confiscated by the Nazis found in a cave near Buchenwald. 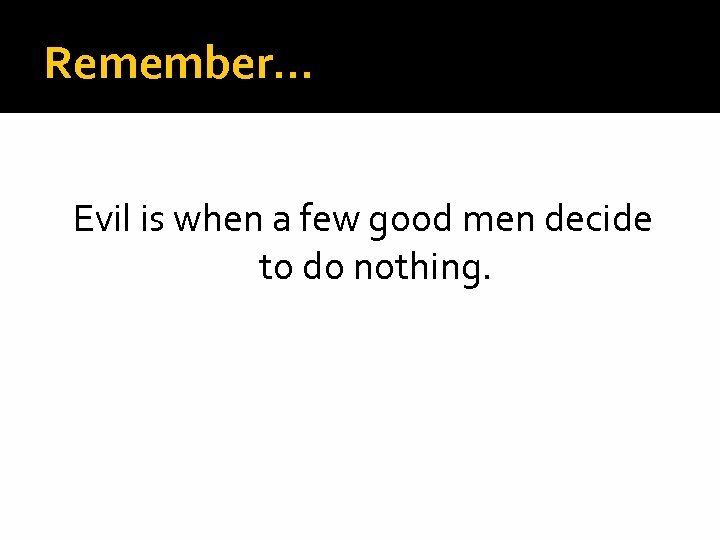 Remember… Evil is when a few good men decide to do nothing.